Having begun in the lower parking lot off of Burnhamthorpe we had made our way through the Bird property and arrived at the double row of pine trees that mark an old driveway. In 1833 Peter McDougall acquired 200 acres of land as a crown grant. The property changed owners a few times until 150 acres of it was purchased in 1913 by W. R. Percy and Ida Parker. In 1914 they built a stone cottage on the top of the hill and used it in the summer to get away from their home in Toronto. The lane way leads up the side of the ravine to the cottage. Climbing the lane you come to the stone cottage. It was built on the foundations of a previous building near an existing barn. In the 1930’s Ida Parker sold the lower parcel of land, including the stone cottage, to her daughter Margaret MacEwan. 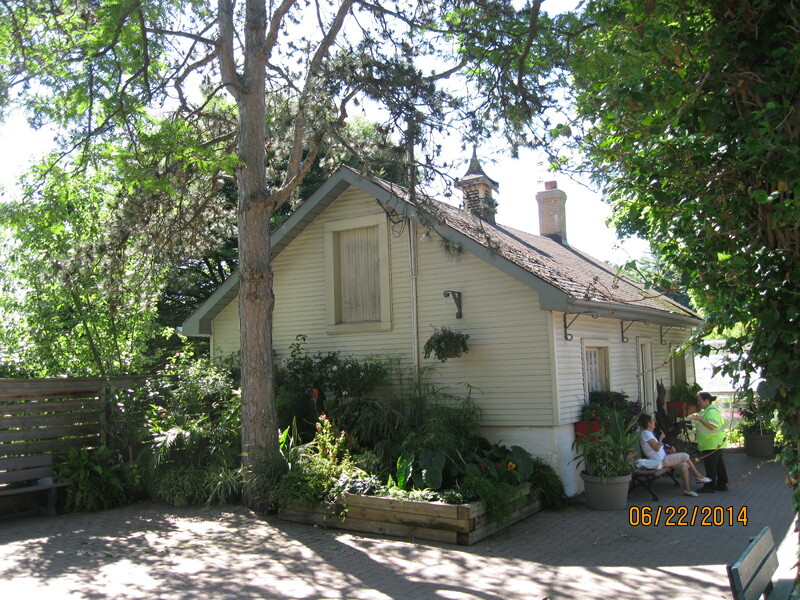 The cottage was expanded in the 1950’s with the intention of matching the style of the earlier piece. It was quite well done and the part of the cottage below that looked like the older was in fact the newer part. I have read in one place that this may be the pickle factory put to a new use. 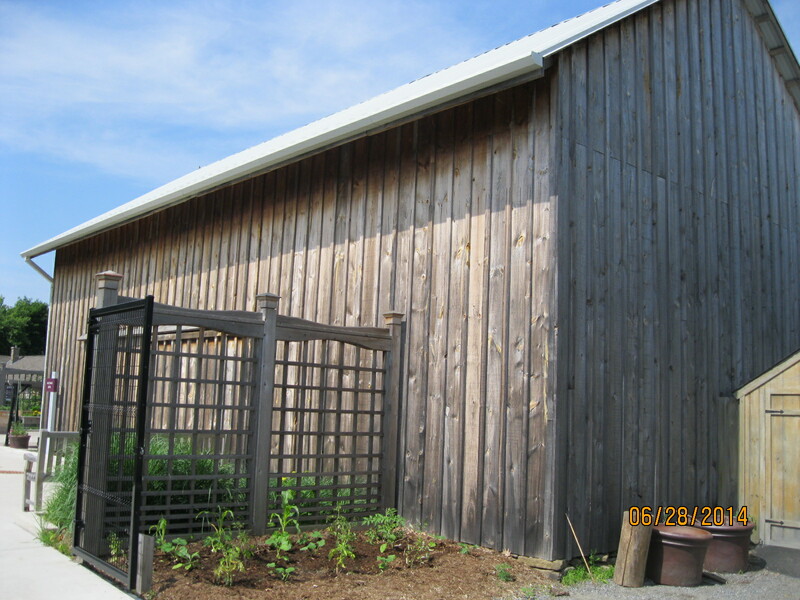 The barn dates to 1865 and is a remnant of the early farming on the property. Although it has been re-clad with new exterior boards, the interior still contains the original timber frame. 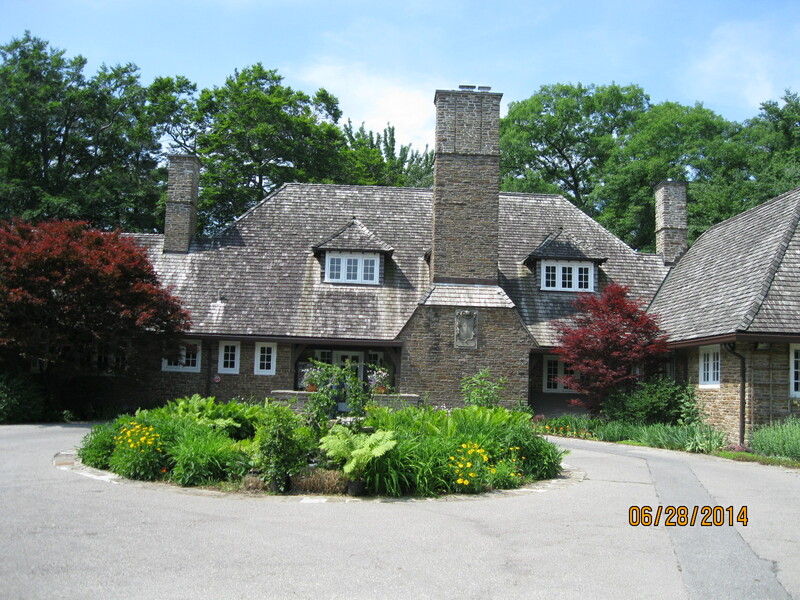 In 1918 Percy commissioned the building of a new home on the property to be called Riverwood. It was built of stone which was hauled up from the river on the lane way past the stone cottage. 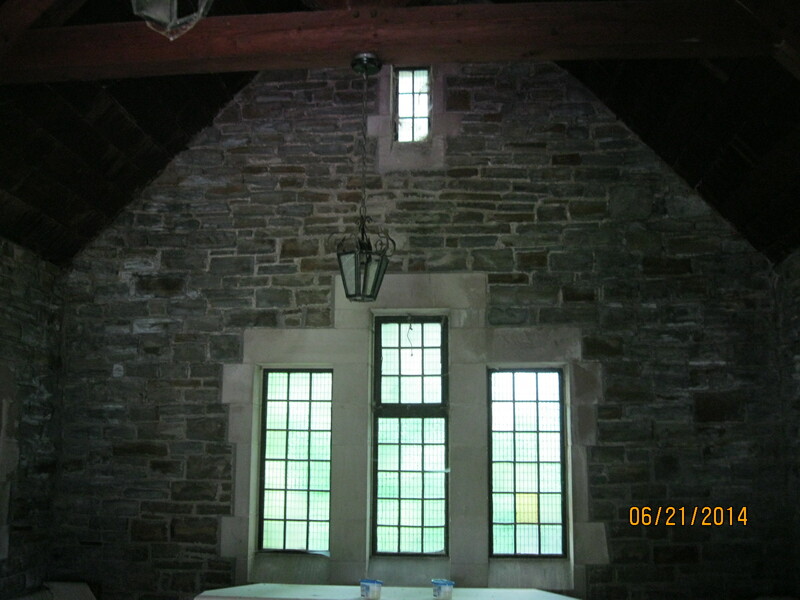 The main part of the building, behind the grand fireplace, was a large party room. Several Canadian Prime Ministers are said to have frequented the home. William Lyon Mackenzie King visited here often during his 22 years as Prime Minister. 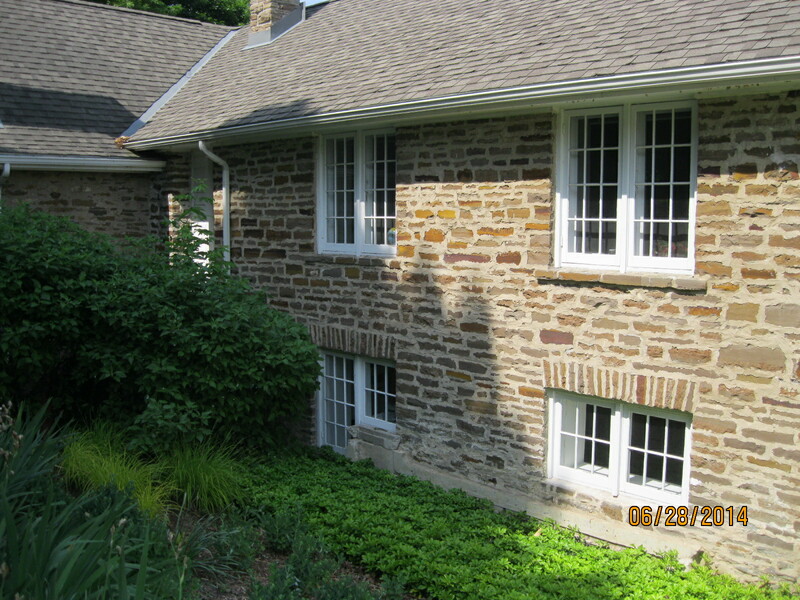 This was also one of the first homes in Toronto Township to have electricity. Along the front driveway sits an old wagon, featured in the cover shot. 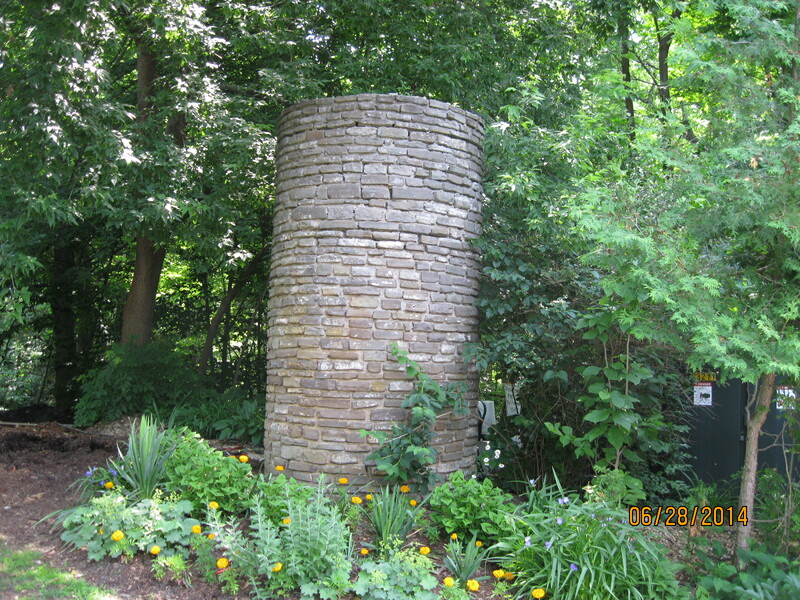 This stone cistern was originally used to hold water that was pumped up from the Credit River. Riverwood sits on a point of land between two small ravines. Chappell ravine on the north side and on the south, MacEwan ravine. When the house was built a swimming pool was built on the MacEwan ravine. The sides and front of the pool are lined with concrete and a set of stairs is built into the south corner. 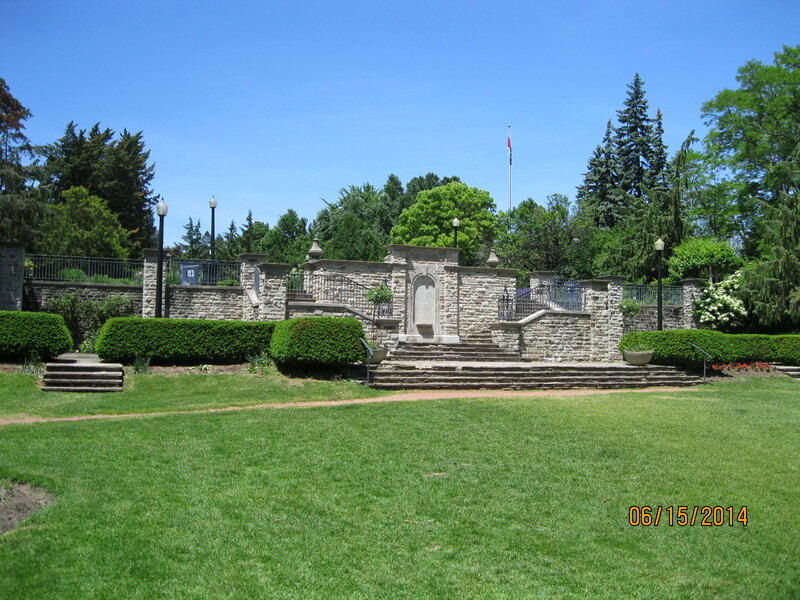 When it was built it was the first swimming pool in what is now the city of Mississauga. It was cold and hard to keep clean so it was eventually abandoned and a new pool was built on the front lawn. The pool is accessible by a stone walkway from the back yard of the house. The walkway passes in front of the pool and leads to the tennis court beyond. In the 1920’s it was very fashionable to have your own tennis court and no estate was complete without one. It is said that Prime Minister Pierre Elliot Trudeau played tennis here. Careful examination can still reveal some of the white lines on the court surface. If you return to the main trail near the pine trees that mark the old lane way you can make your way further north in the park. 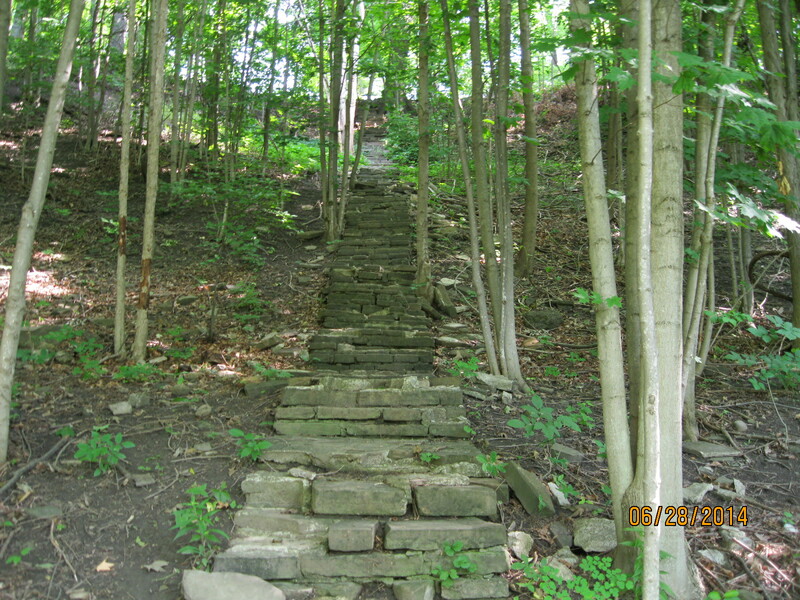 Soon you will come to this old set of stone stairs. Even with some missing, there is still over 100 steps on the hill side. These will take you back up to the back yard of Riverwood. Percy lost his fortune in the stock market crash of 1929 and died in 1931. 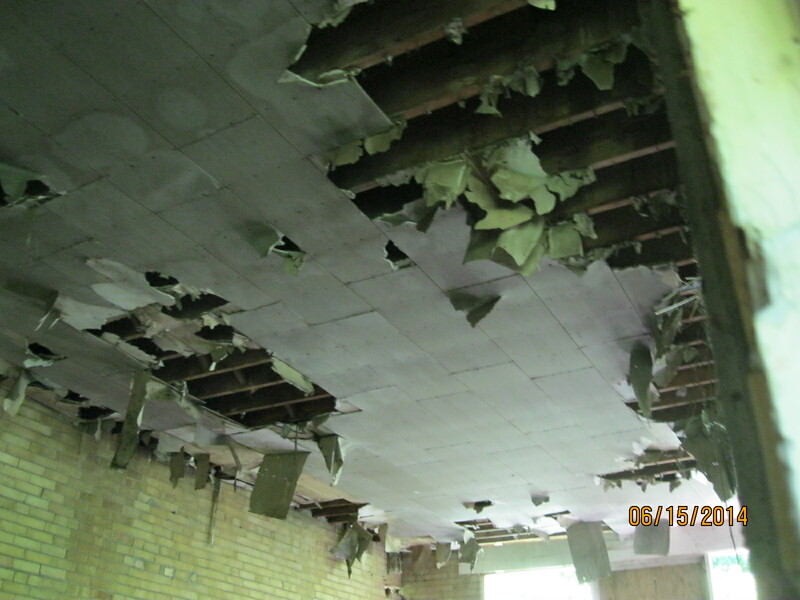 Ida Parker struggled after this and sold off the property in three pieces. She sold the southern portion to her daughter in the late 1930’s. In the 1940’s she sold the northern farm lot to John and Theodosia Zaichuk. (We’ll visit that property in Riverwood part 3). Finally she sold Riverwood itself to Hyliard Chappell in 1954. Chappell was the federal Liberal MP from 1968 to 1972, serving in Trudeau’s government. It was likely during this time that Trudeau visited what was then known as Chappell House. A summary of our 15 top hikes is presented here. This entry was posted in Credit River, Hiking GTA and tagged Credit River, GTA, Hiking, Misissauga on June 30, 2014 by hikingthegta. It was another perfect summer Saturday. The sun was shining and it was 22 degrees to start the hike. We parked at the bottom of the hill in the lower parking lot beside Burnhamthorpe on the east side of the Credit River. This property was part of Riverwood which is described in detail in a separate post titled “Riverwood Estate”. Riverwood Estate was split up and sold off in three parts. 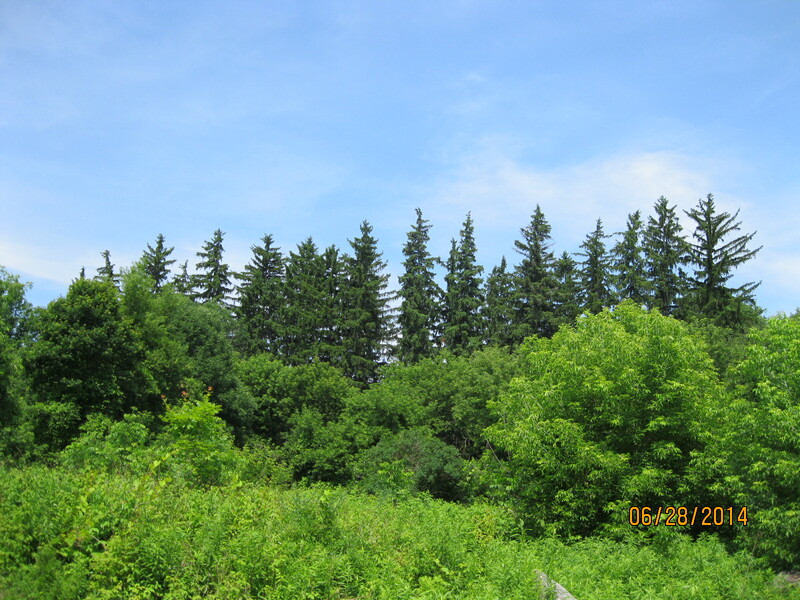 When the Credit Valley Conservation Authority bought the separate properties in the 1990’s, the southern portion was owned by the Bird Family. Riverwood is large enough that it would be too much for a single post. For that reason I will break it into three posts starting with the Bird Property. 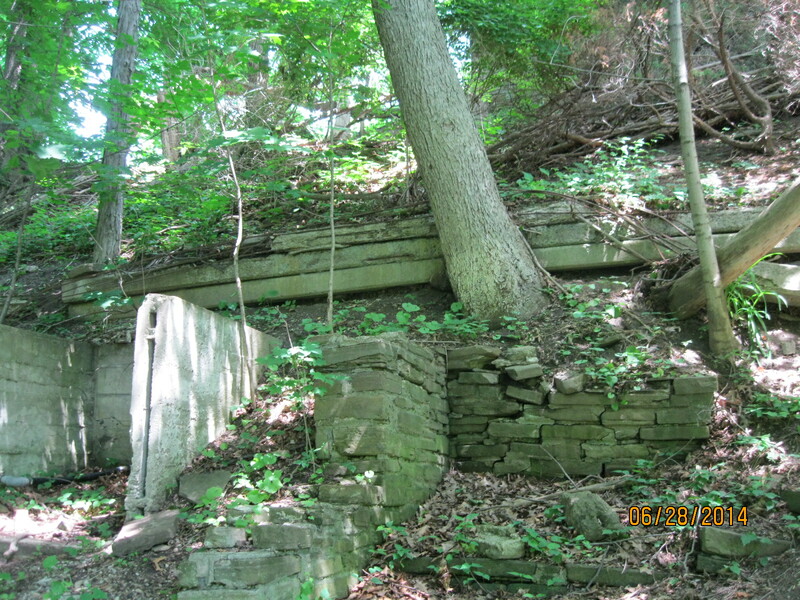 As you hike upstream along the east side of the Credit River you come across the ruins of an old building on the side of the ravine. This building was a pickle factory in the mid 1800’s. This suggests that the adjacent fields were likely being used for growing cucumbers. Notice that the building in the picture below has a combination of stone from the river below and also some later concrete additions. As you follow the trail along the crest of the hill you will come across this old wall that runs for a few yards under this hedge. It ends as suddenly as it began without clues about its original intent. 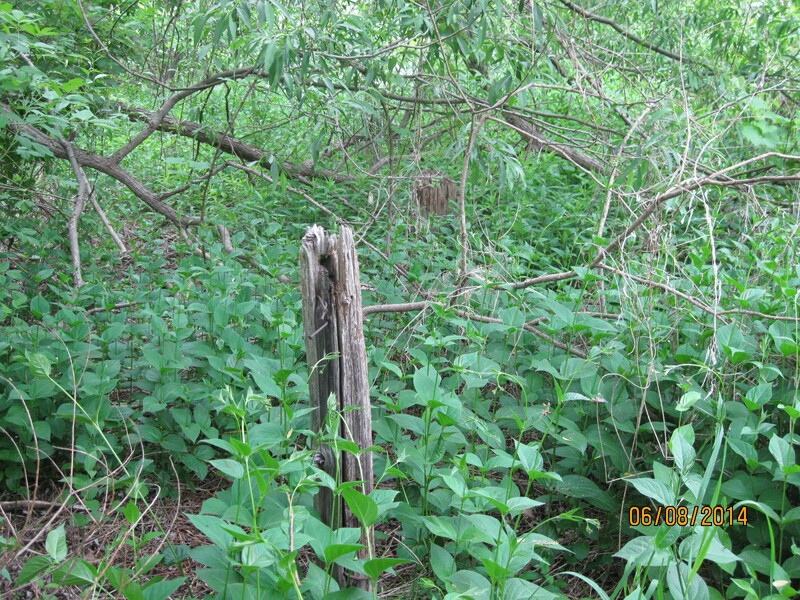 At one point there is a side trail that leads away from the river and into an overgrown field. To the north, a straight line of pine trees in the distance marks the old Riverwood lane way. 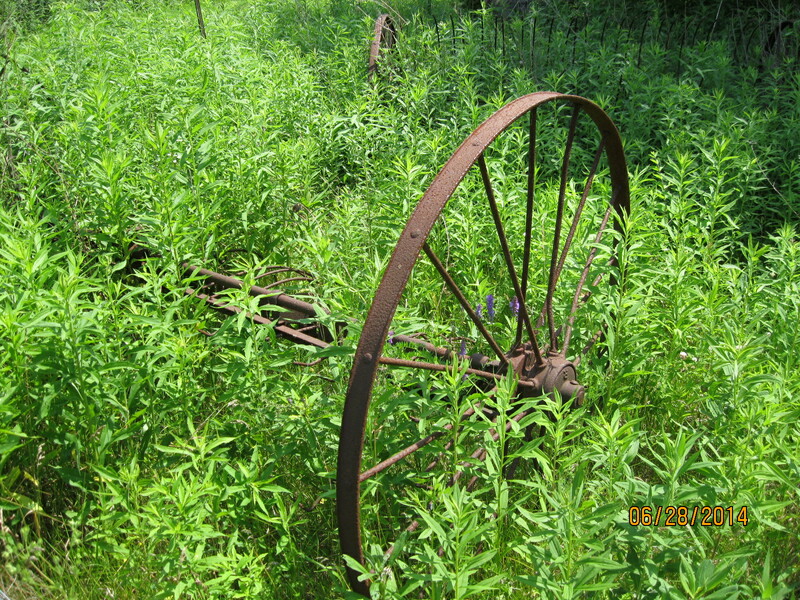 As you enter the field above the river there is a large collection of early 20th century farm equipment. The piece below, along with 3 others the same, were used to turn the hay over for drying before baling it. 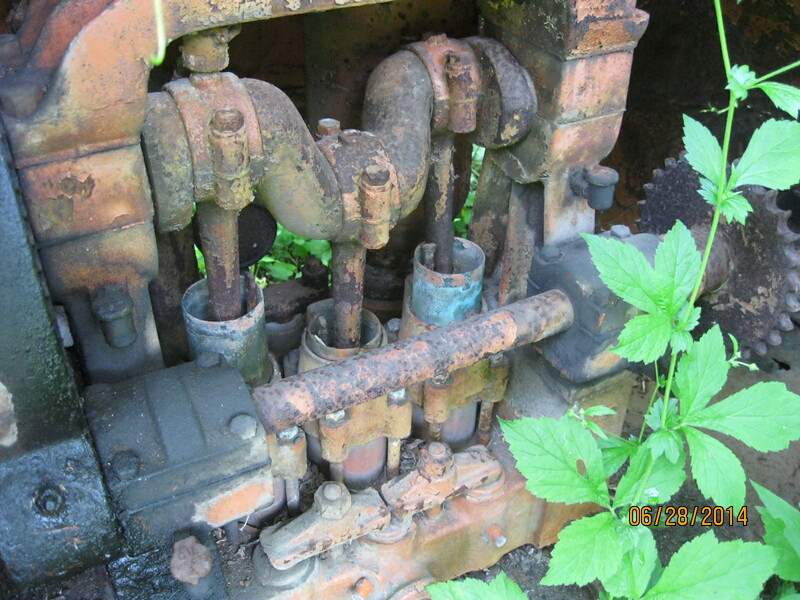 This engine was part of the piece of equipment with the wooden barrel that is featured in the cover photo. 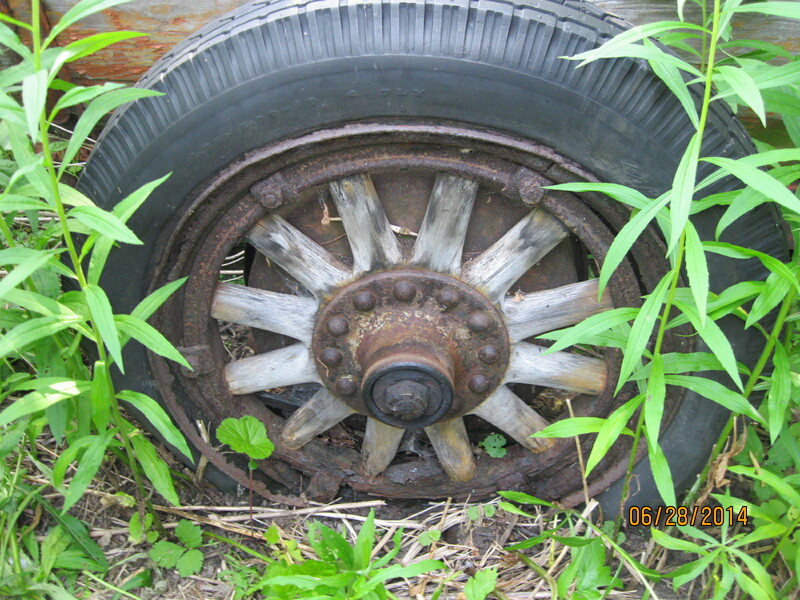 Several of the older pieces of farm equipment had wooden spokes on the wheels. 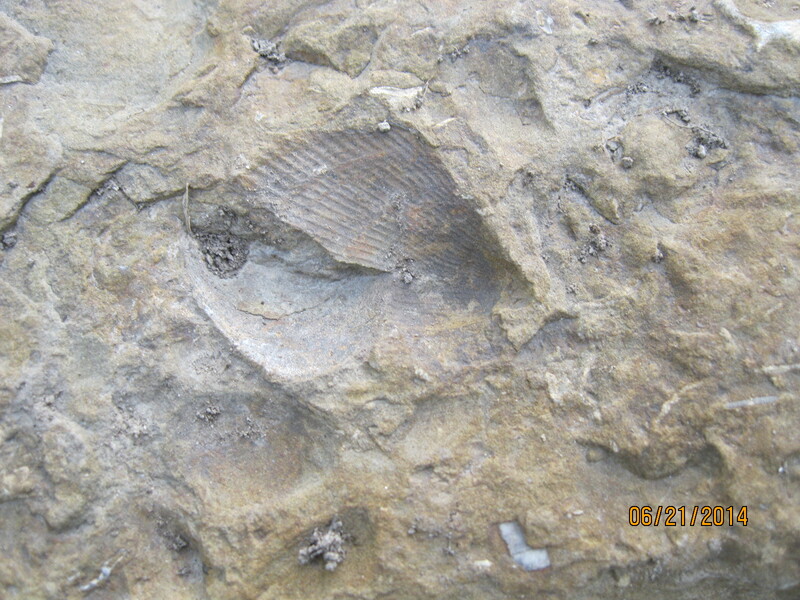 The Credit river is a great place to look for fossils. The one below that looks like a sponge is a coral and the other rock has numerous fossil worms in it. Use caution when hiking in this part of the park if you choose to leave the paved trails. There are at least three plants here that can cause great suffering. 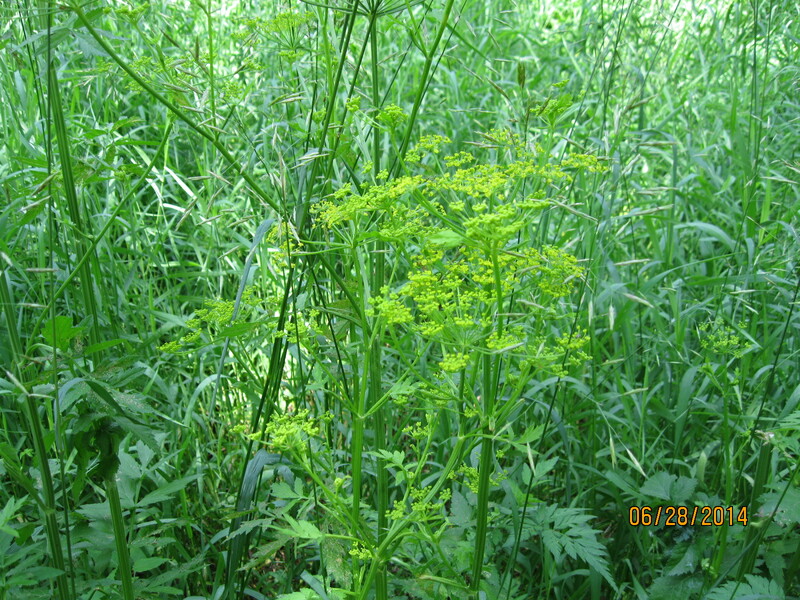 Poison Ivy, Giant Hogweed and Wild Parsnip (the yellow plant below). They can cause rashes, oozing sores and even blindness. As you carry on along the trail you will come to a lane way that leads up the hill side and brings you to the Riverwood Estate. It was sunny and 25 degrees, a gorgeous Sunday afternoon. I parked on Bridle Path and entered the gardens from there. 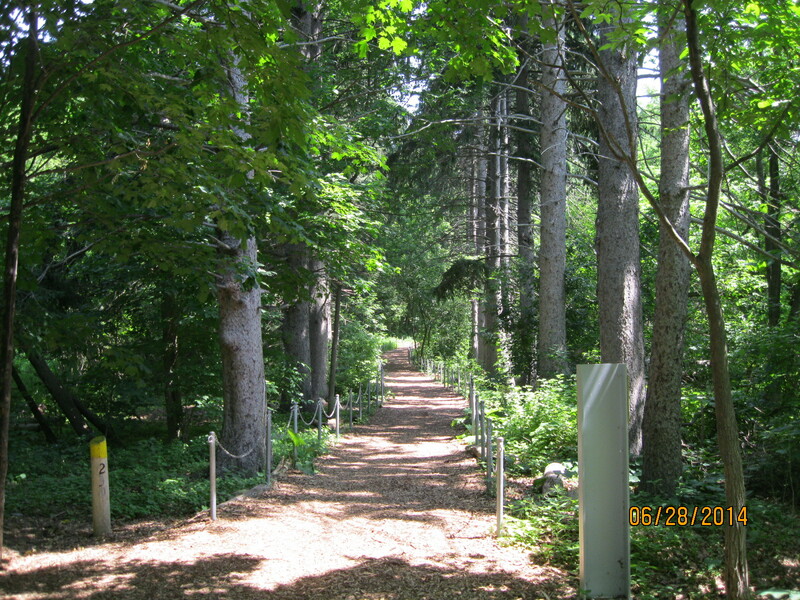 The upper part of the gardens is an arboretum full of many varieties of mature trees. The main trail will lead you down the bluff and into the Wilket Creek valley. Wilket Creek was known as Milne Creek for the first 150 years of settlement. 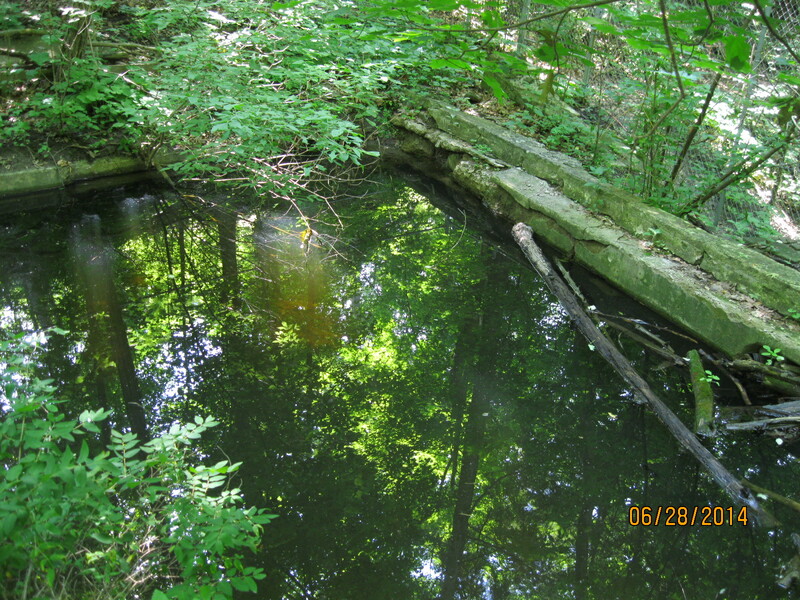 Here, the creek has been dammed to create a small mill pond as seen in the cover photo. A miniature water wheel has been recreated below the dam. 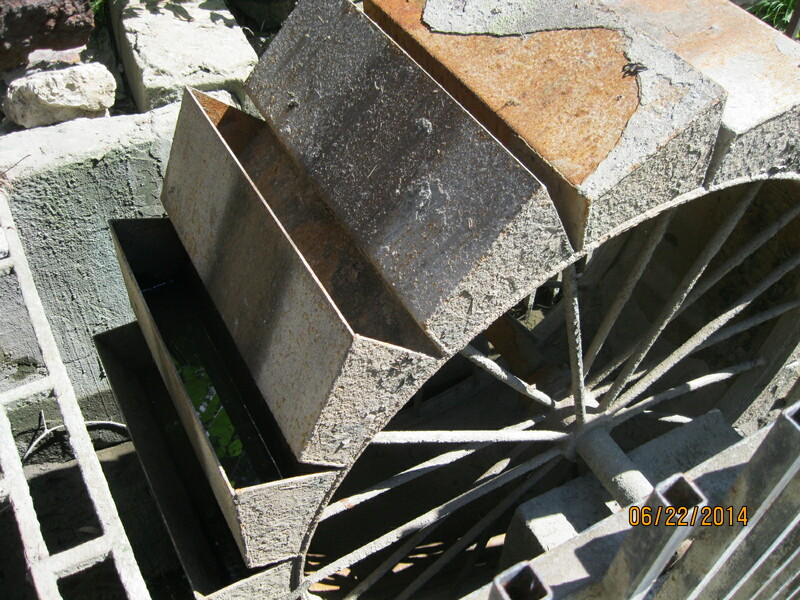 This is an example of an “overshot” wheel where the water would be dropped into the buckets from above to turn the wheel. Inside the mill, the drive shaft that the wheel is turning provides power to turn the gears and pulleys that run the factory. Alexander Milne and his family first settled on this property in 1817. He built a three story mill and a small community grew around it. The mill stood on the east side of the creek an the top floor was used as a saw mill while the lower two floors were a woolen mill. The wooden wheel in the Milne mill was an overshot wheel, 18 feet in diameter. 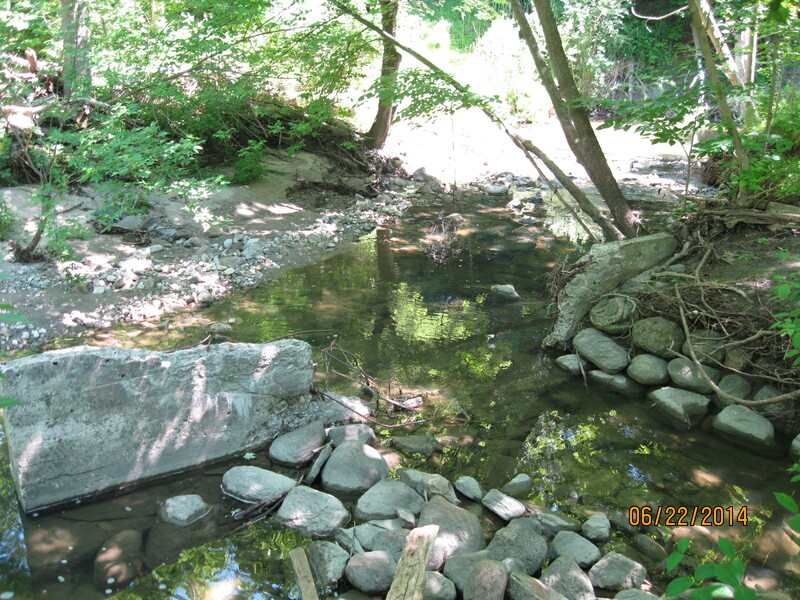 When the water level became inconsistent at Milne Creek, the Milnes moved to their property on the West Don River at Lawrence. Here the town of Milneford Mills was re-established. Two building survive from this era. One is described separately in a post called “Milneford Mills”. The second has been moved back to Edwards Gardens. One of the buildings in Milneford Mills was a wagon shop. The large door on the end of the upper floor in the picture below is typical of wagon shops where painting and drying were done upstairs. A temporary ramp would allow access to the door. 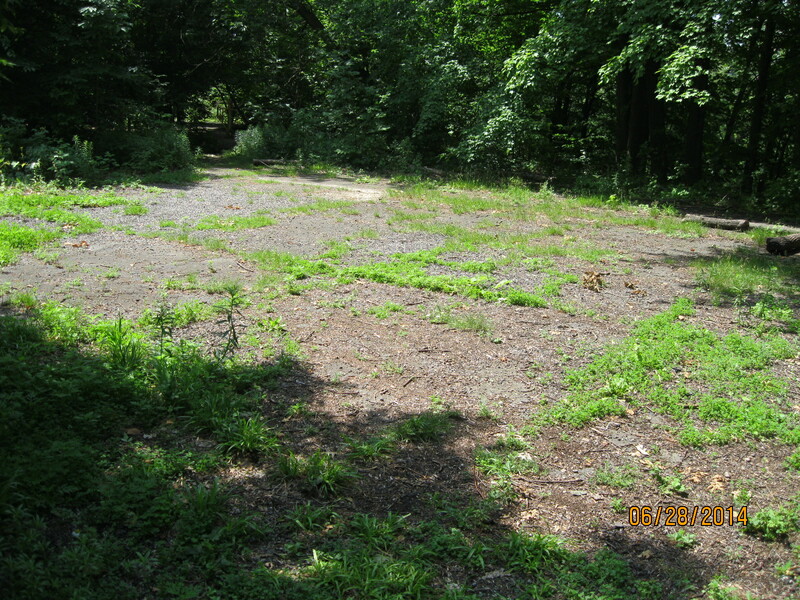 When the Milnes moved the property was left to turn into a weed patch. In 1944 Rupert E.Edwards purchased the property with the intention of making a country estate. Very soon the city was closing in on all sides and Edwards sold everything to the city for a public gardens. Leaving Edwards Gardens you enter Wilket Creek Park. As I walked along the west side of the river I found that there were a lot of small rivulets that cut steep channels through the hillside. I kept having to go back down to the river to get around the valleys. Fortunately there are several sets of “stairs” running up the sides of the hills made of tree roots. 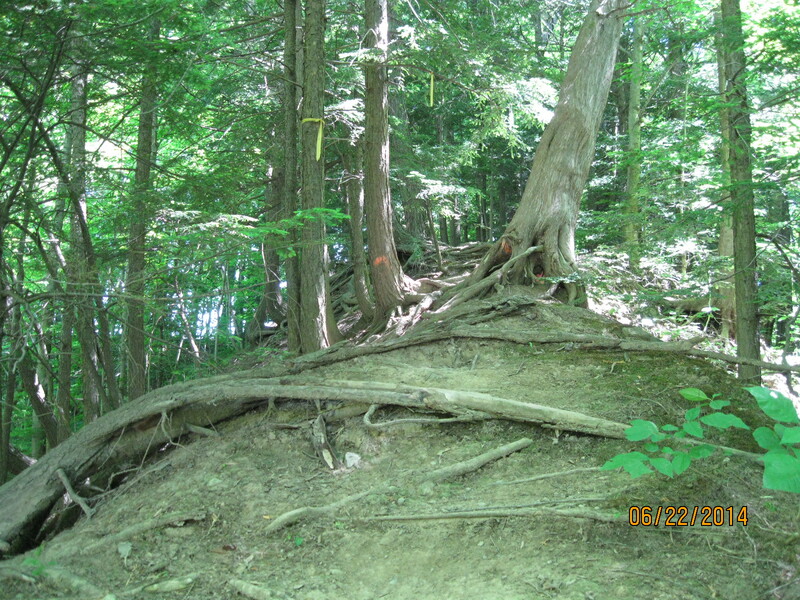 In the picture below the trail runs between the large trees and climbs a point of land which is over 100 feet high. These hill sides have been kept clean by the groundskeepers, but I did find a 1976 nonreturnable Pepsi bottle. Along the way the main path follows the creek crossing it on several bridges. Just north of the fourth bridge up from the mouth of the creek lies the ruins of an old dam. The centre piece has been broken out. Erosion was a constant enemy of the settlers who built dams on the rivers. 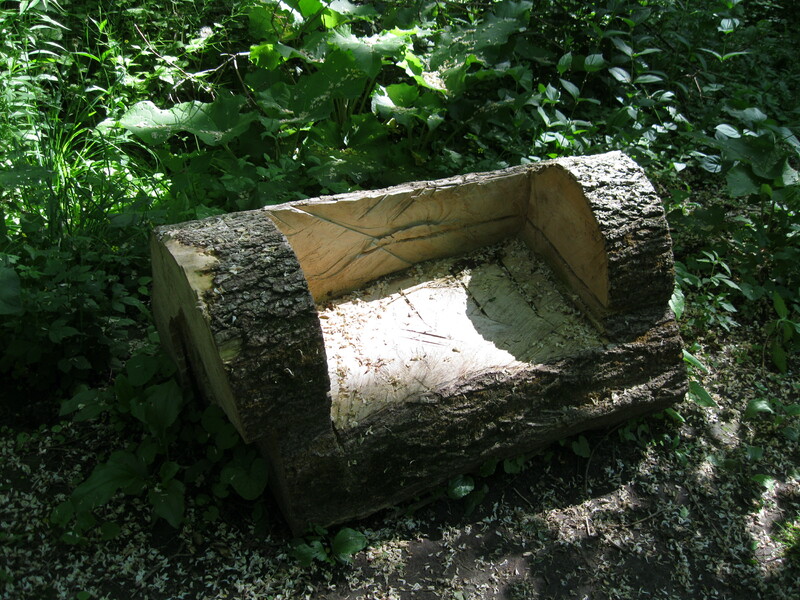 Early wooden and earth dams often had to be rebuilt or repaired every spring. Wilket Creek is prone to flooding and the one end of this dam has been washed clean so that water now flows around it. This may have been the mill race for this dam but I suspect that it is the original creek bed and that the old mill race has been taken over by the creek. 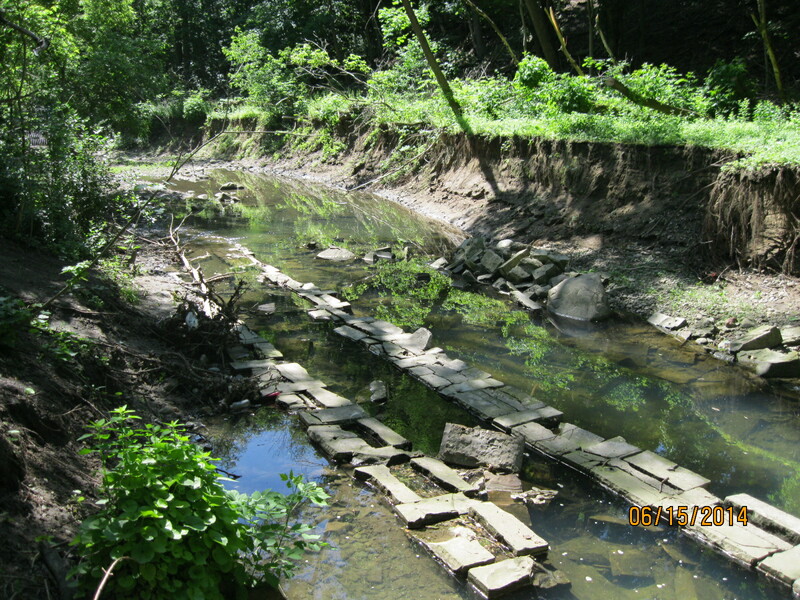 The remains of another dam stand near the first foot bridge up from the mouth of Wilket Creek at the West Don River. 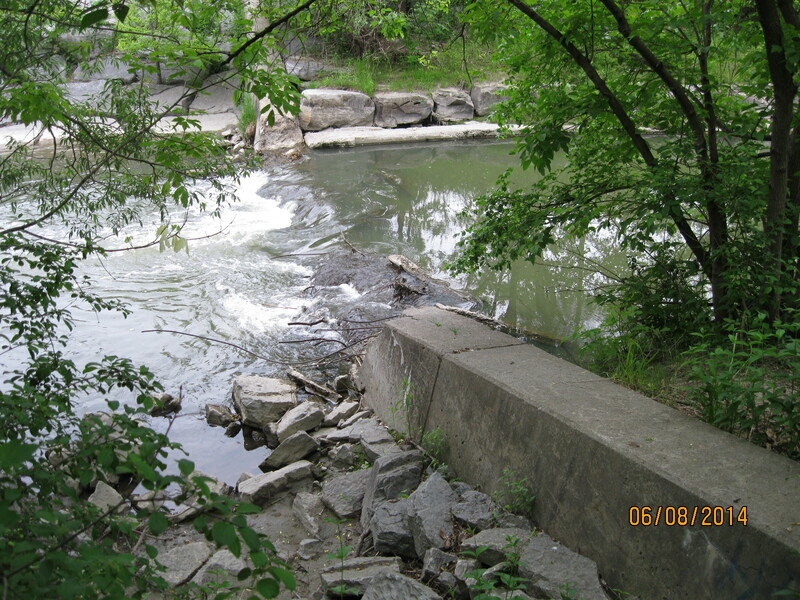 This one, like many others, was likely destroyed by the conservation authority as part of flood control measures implemented after Hurricane Hazel. 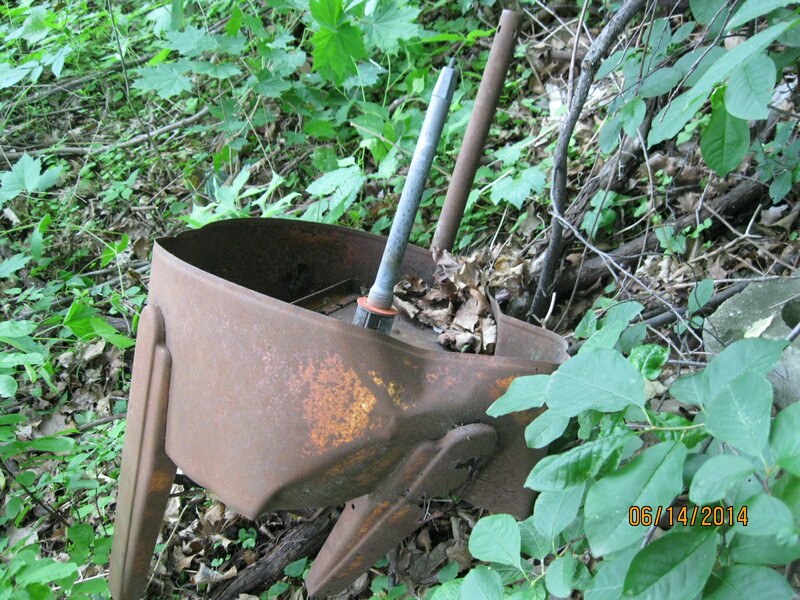 It has been difficult to find any information on these other millers in the Wilket Creek watershed. At one point along the top of the hill I began to follow a set of deer tracks through the woods. 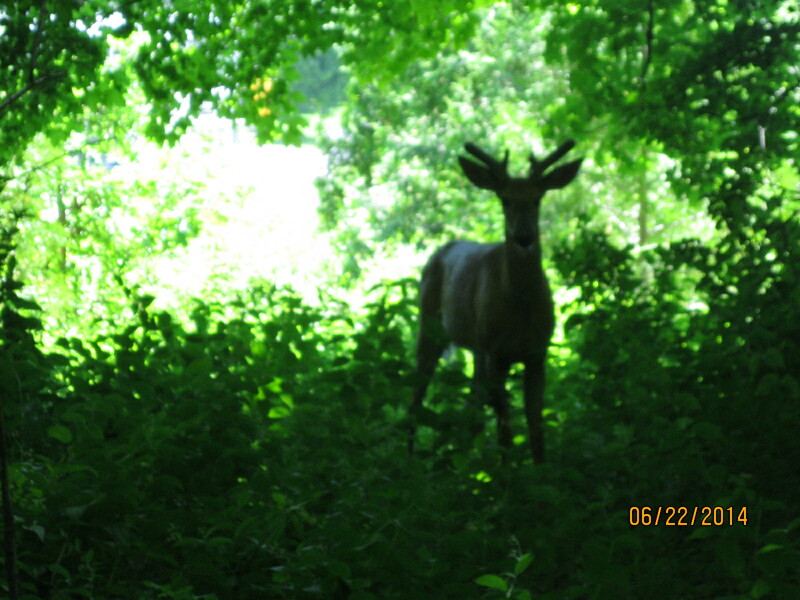 It wasn’t too long before a young buck stepped out of the woods and posed for a few pictures. I normally see the tail ends of deer as they try to get away but this one was looking me straight in the eye. I had no way of knowing if he was used to being fed by humans or was thinking about trying out his new antlers. He followed me through the woods until I found a place to get out onto Leslie Street. White Tailed deer bucks grow a new set of antlers every year, beginning in the spring. The antlers generally grow larger every year until the animal reaches it’s prime at 5-7 years of age. Antlers can grow up to an inch per day and are covered with a tissue known as velvet during the growth period. In late summer the antlers calcify, becoming hard and losing their velvet. The antlers come in handy in the fall when the males fight for supremacy and the attention of the females. At the start of winter when mating season is complete they lose their antlers. Having circled the deer I found a way back into the trees. 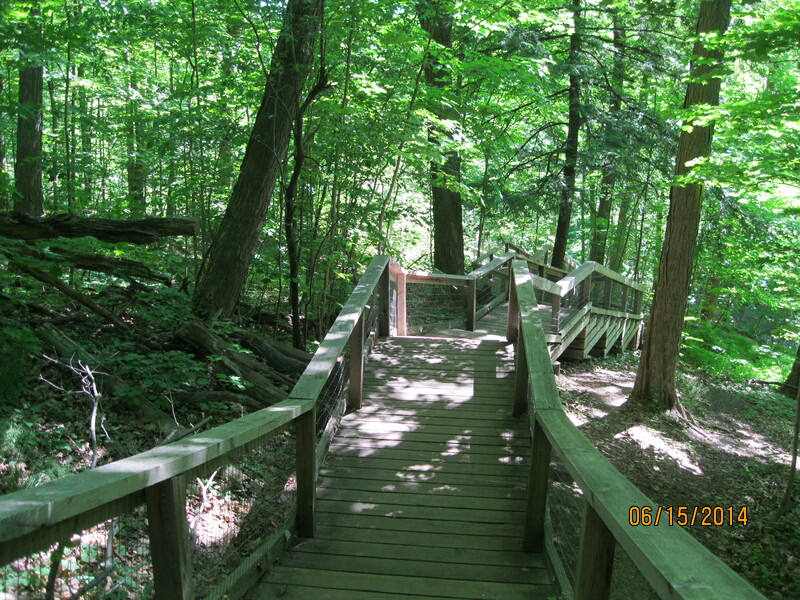 The trail makes its way along the crest of the ravine until it reaches Sunnybrook Park and the West Don River. 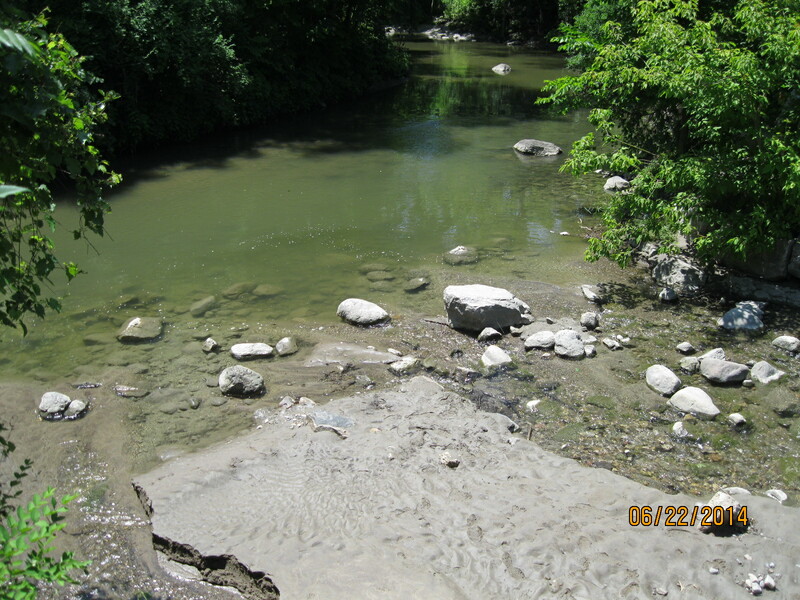 Wilket Creek empties into the West Don River in a rather unspectacular way just beside the roadway into the park. 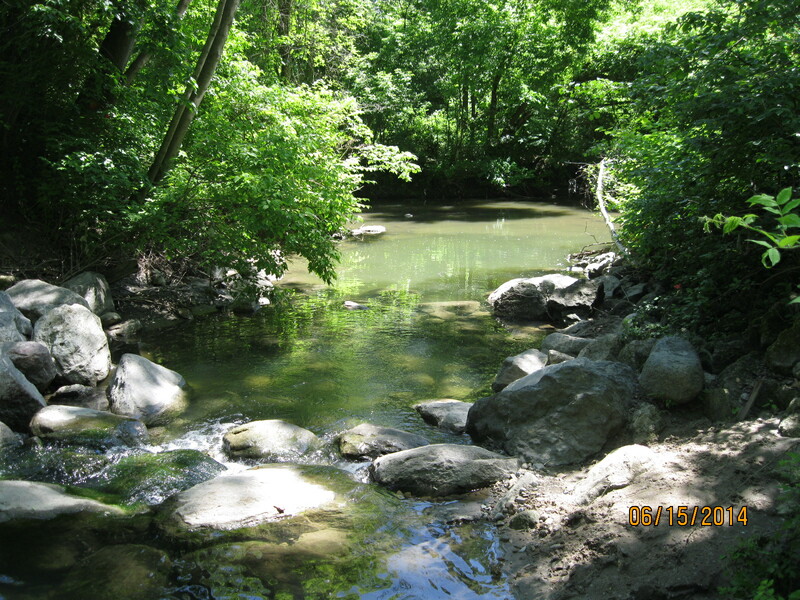 This entry was posted in Don River, Hiking GTA and tagged Don River, GTA, Hiking, Toronto on June 25, 2014 by hikingthegta. Summer officially started at 6:51 am. So we did too! It was a beautiful morning. As I arrived on Emmett Road I saw a white tailed deer walk off of the soccer field (World Cup fever has taken over everywhere) and cross the road right in front of me. She stopped and waited until I had my camera almost ready before disappearing into the woods. We parked in the parking lot on Emmett and entered the woods on the east side of the river. This property was originally granted to John Dennis who died in 1832 in Toronto’s cholera epidemic. His grandson, Henry Dennis, ran a saw mill on this site after 1851 but we saw no traces of it. We walked north along the east side of the river planning to cover lots 1 through 5 between Eglinton and Lawrence Ave. A tall smoke stack on the eastern hill marks the site of West Park Healthcare Centre. It was opened in 1904 as the Toronto Free Hospital For Consumptive Poor. Consumption is an older term for Tuberculosis or TB. The hospital was generally known as Weston Sanitorium or “The San”. The first effective treatment for TB was Streptomycin in the mid-1940’s. It was given by injection or intravenous and became the cure for “the white plague”. 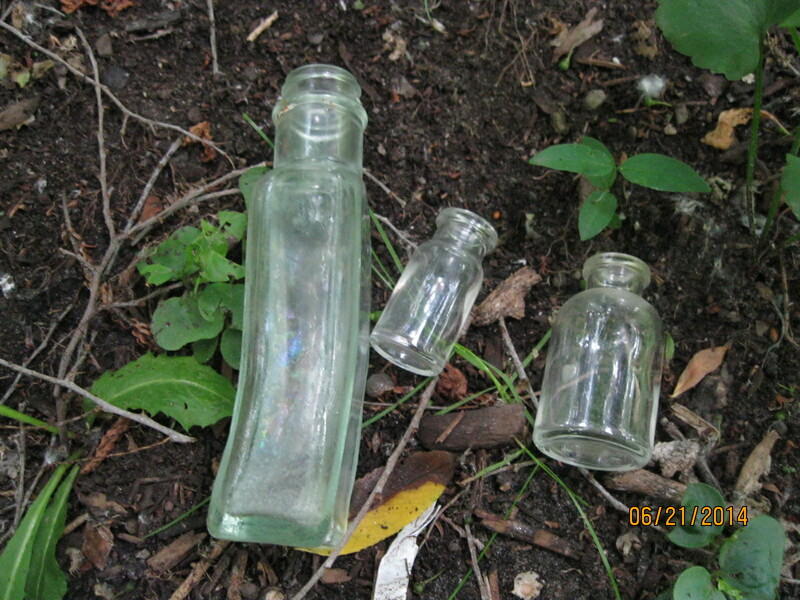 Close to the river, near the old hospital there is a large area of bottles in the woods. There are dozens of little medication bottles for injections. The smallest one in the middle of the picture below is dated 1948 and the slightly larger one on the right is 1945. I have seen many medicine bottles shaped like the long rectangular bottle but none of them curved at the bottom like this one. It has HSP for hospital imprinted on the bottom and the shape may be for hanging it for IV purposes. Glass containers were first used in the mid 1940’s for IV and were initially packed by the hospital pharmacy as this one likely was. Later, they were packed by major companies and then plastic replaced glass containers in the 1970’s. Any or all of these three bottles could have contained Streptomycin for treating the TB patients in the hospital. 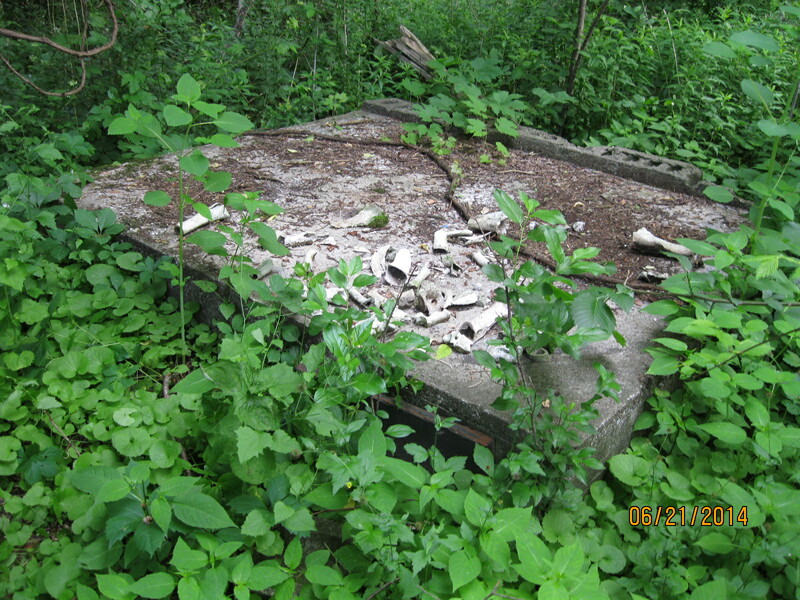 In the woods between the bottles and the hospital on the hill lie the remains of some old buildings from the farmstead on the former John Dennis property. John Dennis was a United Empire Loyalist and it was 40 acres of his property on which the hospital was built. The picture below is the front entrance porch for the house. A few feet away there are several of these long cement structures which appear to be part of the fence line. 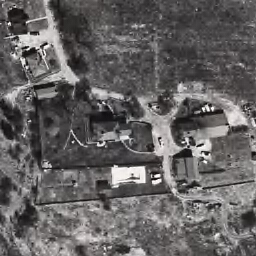 This is a view from 1962 in which the house can be seen on the right with it’s little square front entrance porch and the fence line near the bottom. 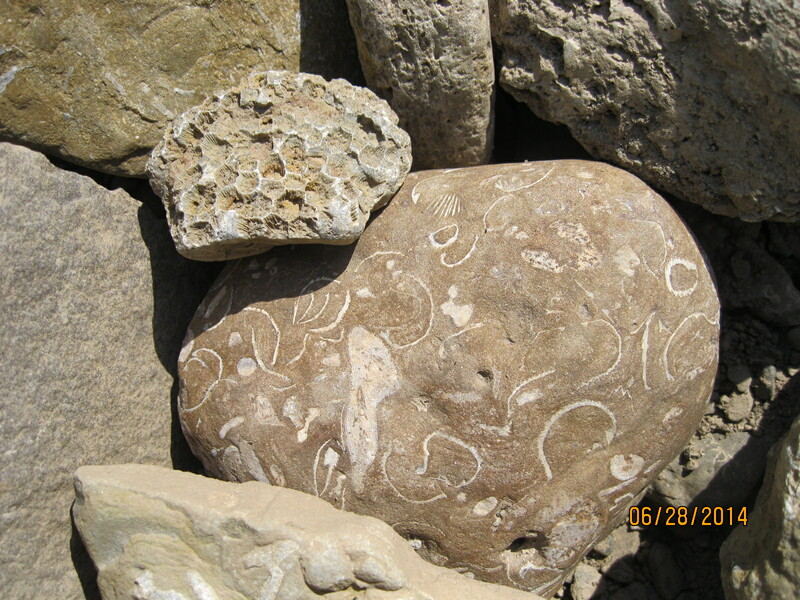 Along the water’s edge we found many fossils including Crinoids and this Brachiopod fossil. As you walk along the east side of the river you will come to a larger water fall. The east wall extends all the way from the river to the base of the ravine. 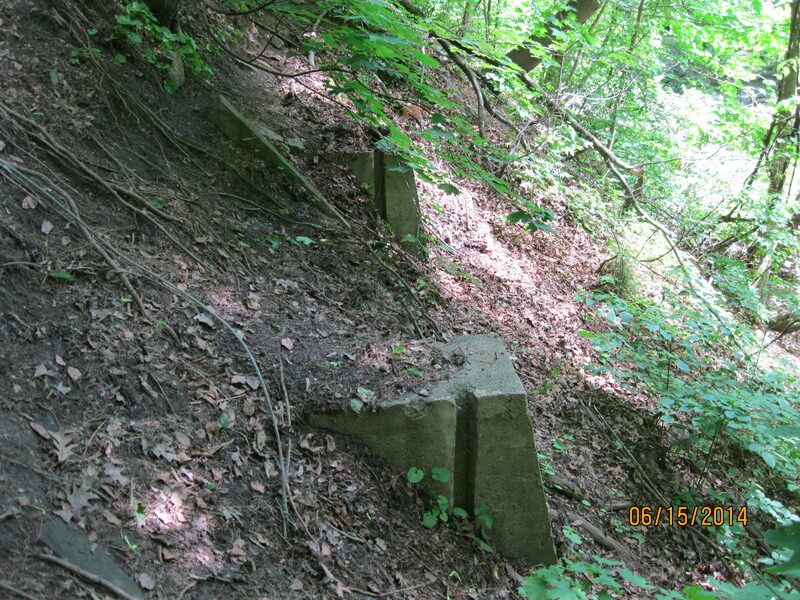 If you climb the ravine on the trail at the end of this wall you will find St. John’s Cemetery On the Humber. John Denison came to York (Toronto) in 1796 and lived with Governor Simcoe at Castle Frank which was the first dwelling built by a white man in York. In 1798 he purchased lots 3 and 4 on the Humber river. The Denison men established themselves by serving in the war of 1812 and the rebellion of 1837. While living in York, John had lost his infant daughter Elizabeth. She was buried in the garden at Castle Frank because there was no burial ground in the town of York. When he established himself on the Humber he had her moved to a plot of ground overlooking the river. 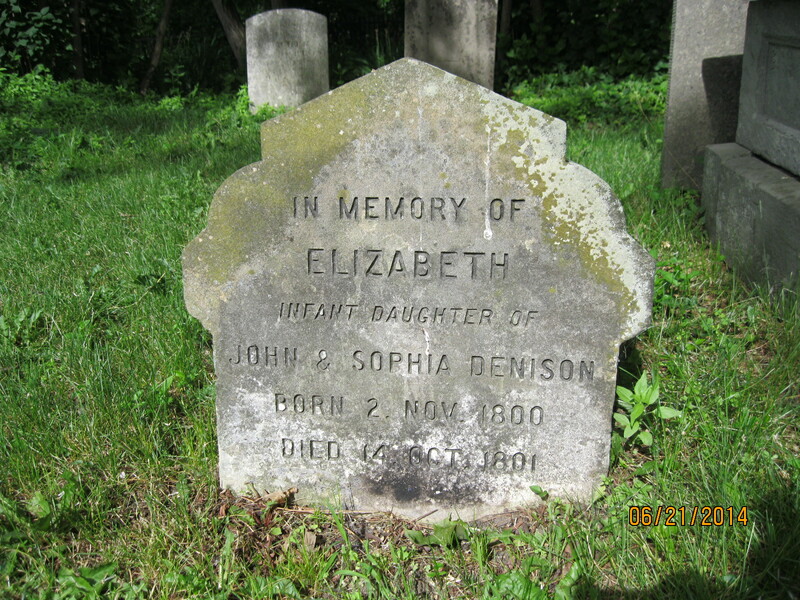 Elizabeth’s untimely death accounted for what surely must have been one of the first modern burials in Toronto. 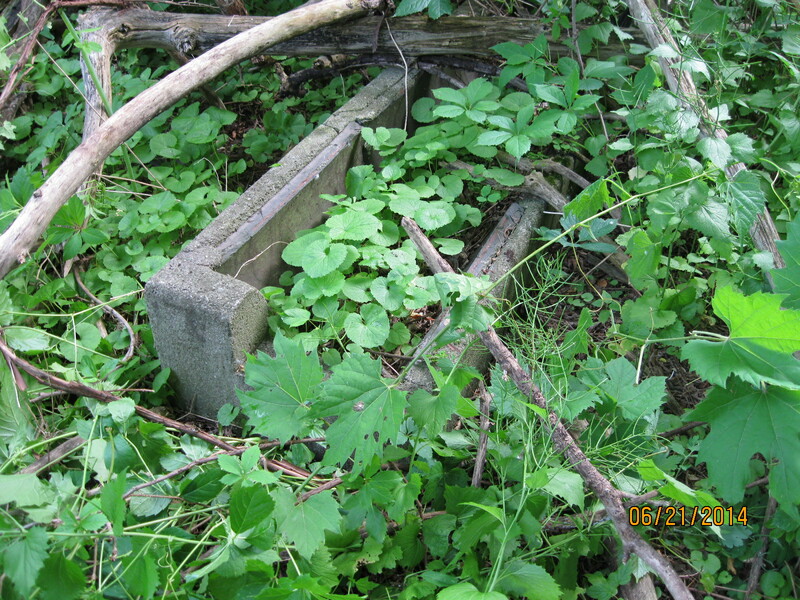 This cemetery is still in service and has been used exclusively for family members related to John Denison and the family of his wife Sophia Taylor. 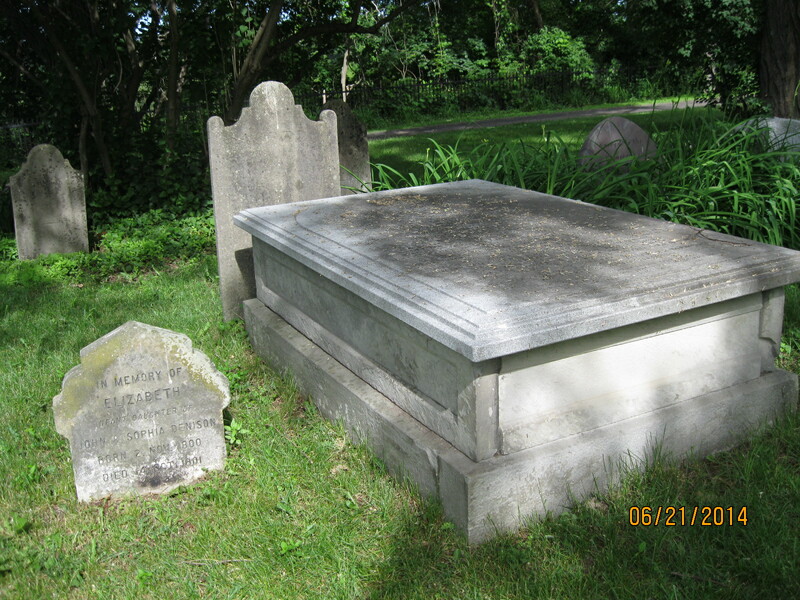 John and Sophia Denison are buried beside their daughter. In 1930 a chapel was erected by the Denison family in memory of George Taylor Denison (1816-1873). The grounds crew gave us a rare opportunity for someone other than family to see inside the chapel. 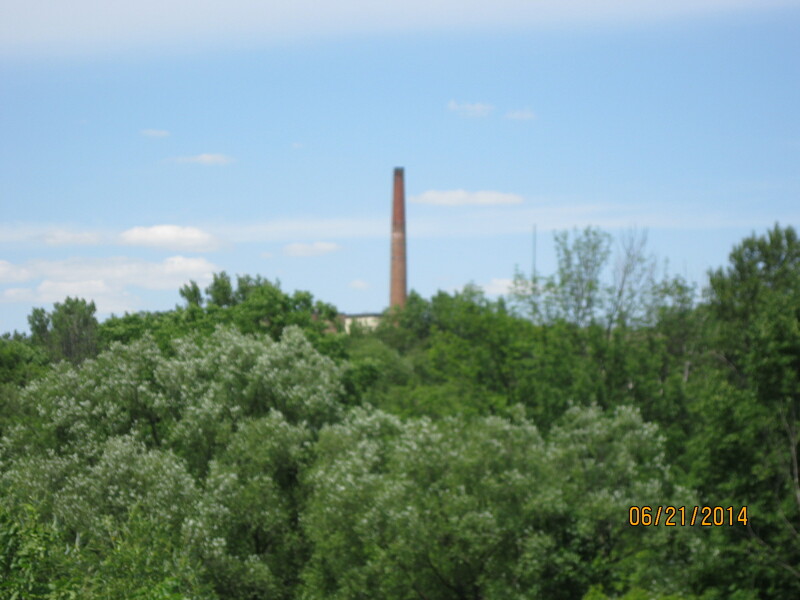 The smoke stack from the Sanitorium as seen from the Eglinton Street bridge. 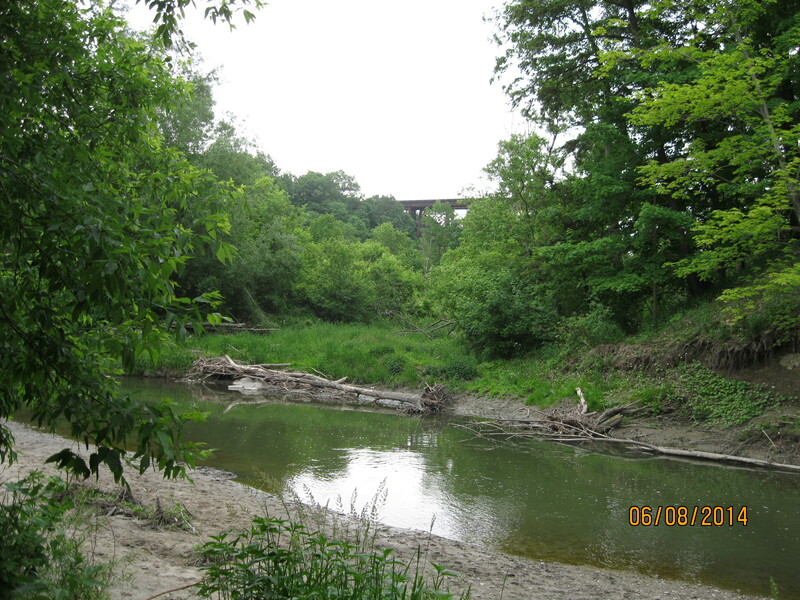 This entry was posted in Hiking GTA, Humber River and tagged GTA, Hiking, Humber River, Toronto on June 22, 2014 by hikingthegta. We parked on Emmett Ave and crossed the Humber on Eglinton. 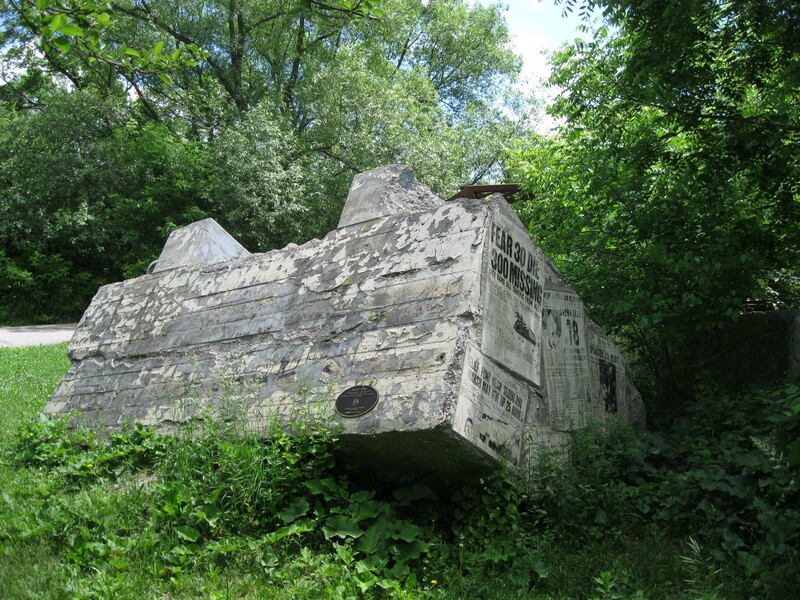 On the west bank stands a memorial to the Ukrainian Canadian War Heroes and we descended to the river level near there. Following the hillside between here and where the Humber Creek meets the Humber River is difficult and we alternated between hillside and river side. Whitetail Deer mate (rut) in late October or early November and give birth to up to three fawns in late May or early June. Along the way we found a spot where a fawn, only a few weeks old, had been down to the river to drink. 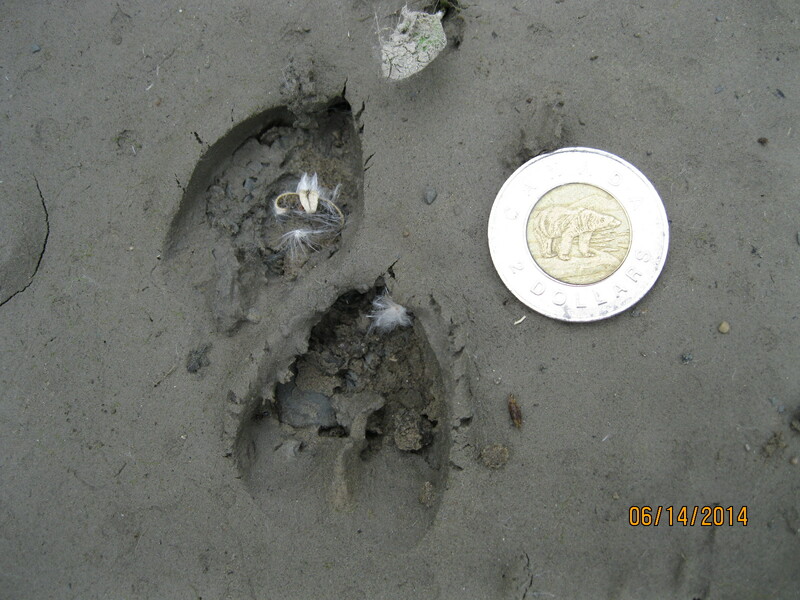 By comparison, the foot prints of an adult deer are about three times the size of the toonie. 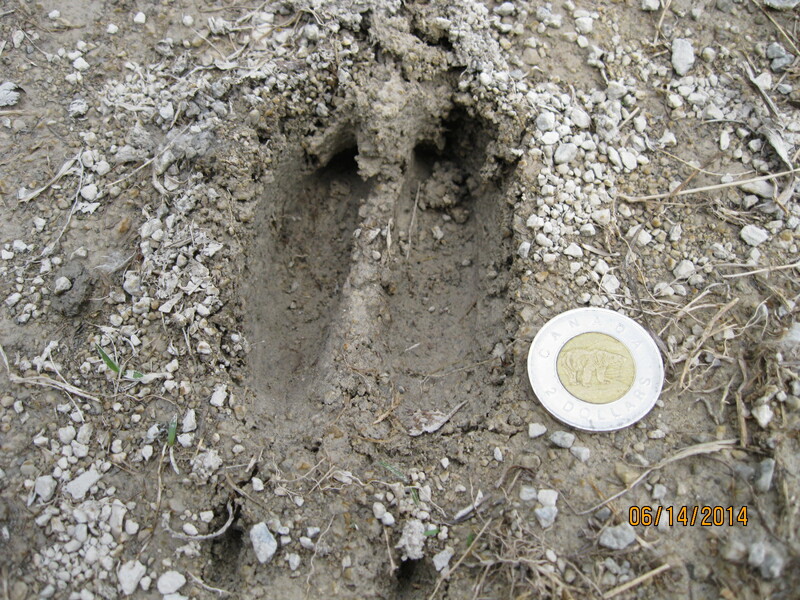 The foot prints in the picture below were found on one of the baseball diamonds in the park where the deer was apparently thrown out at second base. The first electric washing machine was the 1907 Thor machine built by a Chicago company called Hurley. The first washing machine to use a drum, replacing the ancient washboard, was patented in 1851. It was powered by a hand crank. To remove water from the clothes after washing, a pair of rollers called a wringer or mangler were used to squeeze the excess water out. 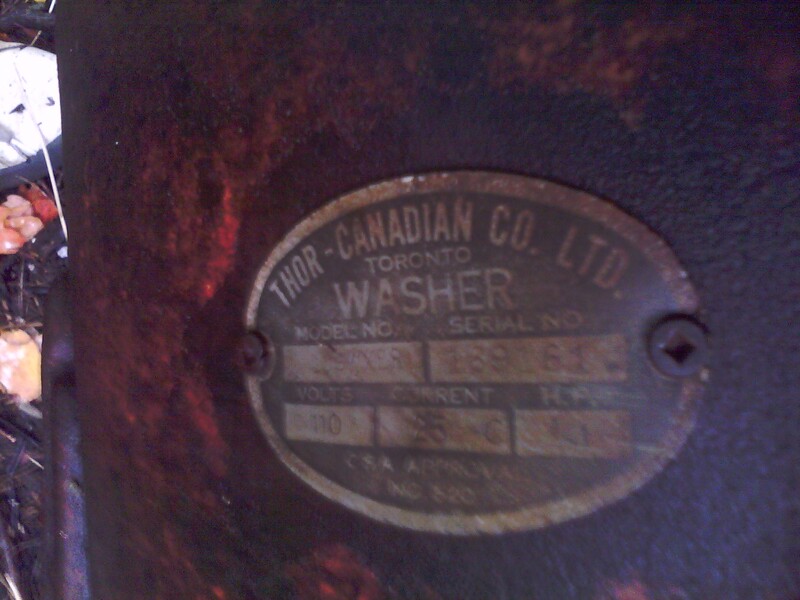 We found an old washing machine likely from the mid-1940’s manufactured by Thor Canadian Co. Ltd. Toronto. The aluminum pole in the centre held the drum and the rusted steel pole held the wringers. The Canadian Standards Association (CSA) was created in 1944 from The Canadian Engineering Standards Association. In 1946 they introduced the CSA logo. This name plate says CSA but lacks the logo. That, along with it’s low CSA approval number (520), suggests that it is from 1944 or 1945. We came across an extensive race track built through the trees for remote control cars. It appears to have been abandoned recently. When Ontario was surveyed for settlement it was frequently laid out in 1000 acre square sections with a road allowance along all 4 sides. The north/south roads were called lines and the east/west ones called side roads or concessions. Within, the parcels of land would usually be divided into 5 land grants of 200 acres each. Five lots ran north between side roads and extended between the two lines. In York Township, Eglinton Avenue was known as Base Line and the lot on it’s north side was known as lot one. Lawrence Avenue ran along the north side of lot five and was known as 5th side road. Other side roads going north were Wilson/York Mills (10th SR), Sheppard (15th SR), Finch (20th SR) and Steeles (25th SR). So York Township had 25 lots between Eglinton and Steeles. Going west the lines were Bathurst (1st Line West), Dufferin (2nd Line), Keele (3rd Line), Jane (4th line) and Weston (5th line). This grid is lost in the maze of the city but is still very evident in rural Ontario where there are often 5 grand old Victorian homes between the side roads marking out the original lots. We were hiking between the 4th and 5th lines on lots 1 through 5. 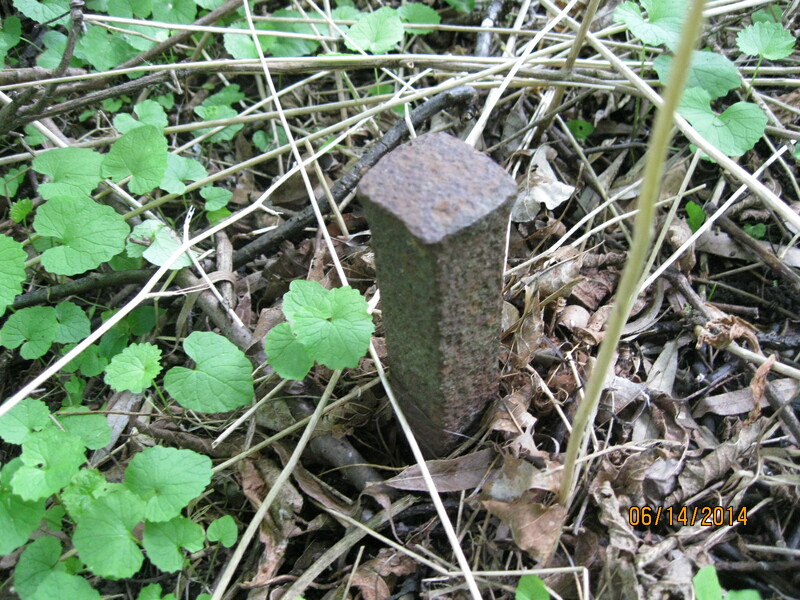 A surveyor’s stake lets us know that we are moving off lot two onto lot three. Raymore Drive is on lots 4 and 5 which was owned by the Scarlett family until the 1850’s. 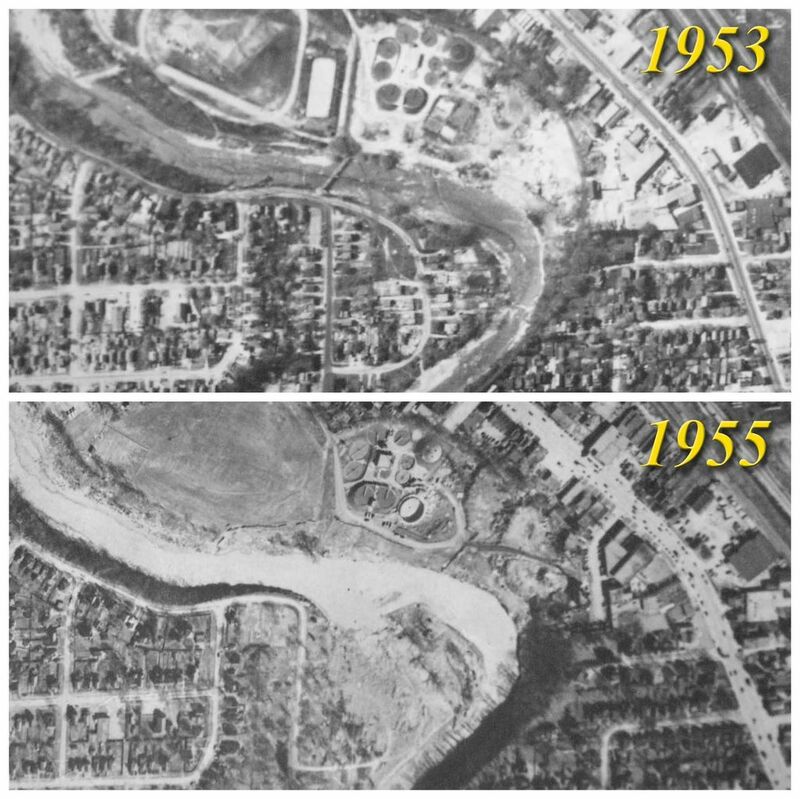 When Hurricane Hazel hit on October 15, 1954 Raymore Drive was home to a subdivision along a curve in the river. A footbridge crossed the river just upstream of the community and when the water level in the Humber rose by 20 feet it swept it off of one abutment swinging it out into the river. This caused the water in the river as well as a lot of debris to be re-directed onto the area of Raymore Drive. 14 homes were washed away, many with their occupants still inside. Of the 81 people who lost their lives in the storm, 35 of them lived on Raymore Drive. The cover photo shows the street on the morning after the storm. 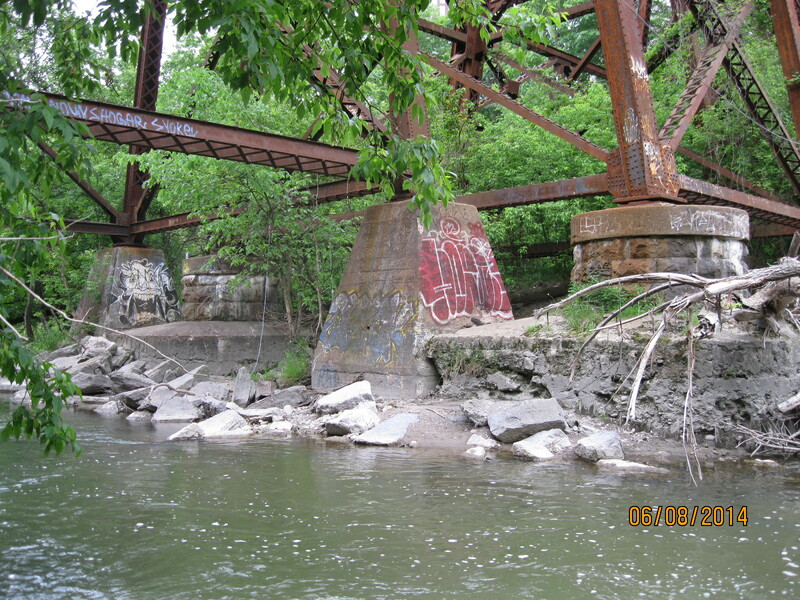 The footbridge abutment was thrown up on the east side of the river. 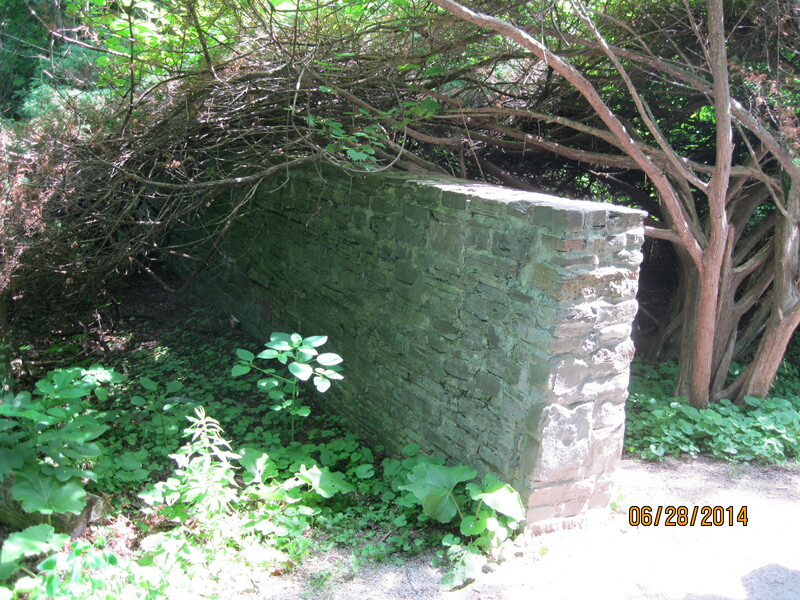 The second abutment still stands on the middle of the river where it was washed by the flood. Raymore Drive as it appears today with new growth trees where rows of houses once stood. Raymore Drive as seen in this before and after comparison. In the 1953 photo there are two streets of houses tucked inside the curve of the river. The footbridge is seen crossing the river on an angle. In the 1955 picture the area has been swept clean. 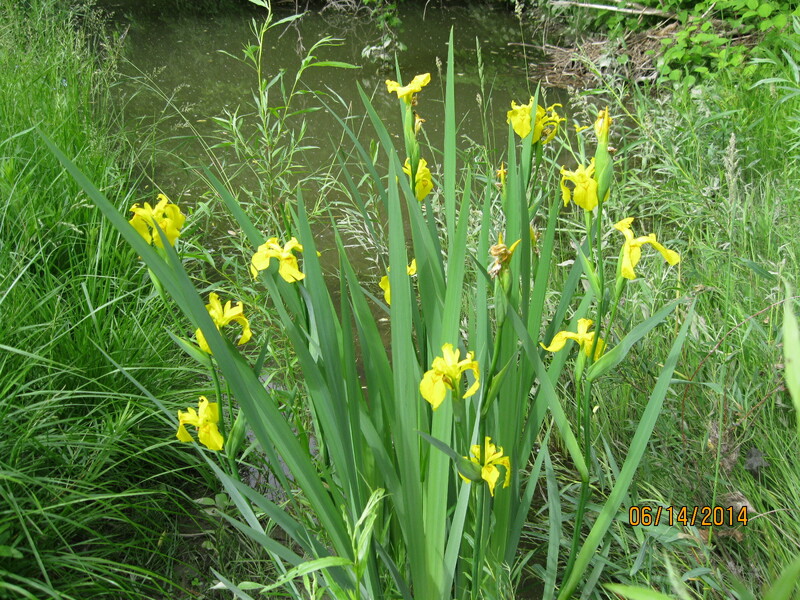 The Yellow Iris is native to Europe and parts of Asia but in Canada it is considered to be an invasive species. It was first identified in 1911 in Newfoundland and in 1940 in Ontario. 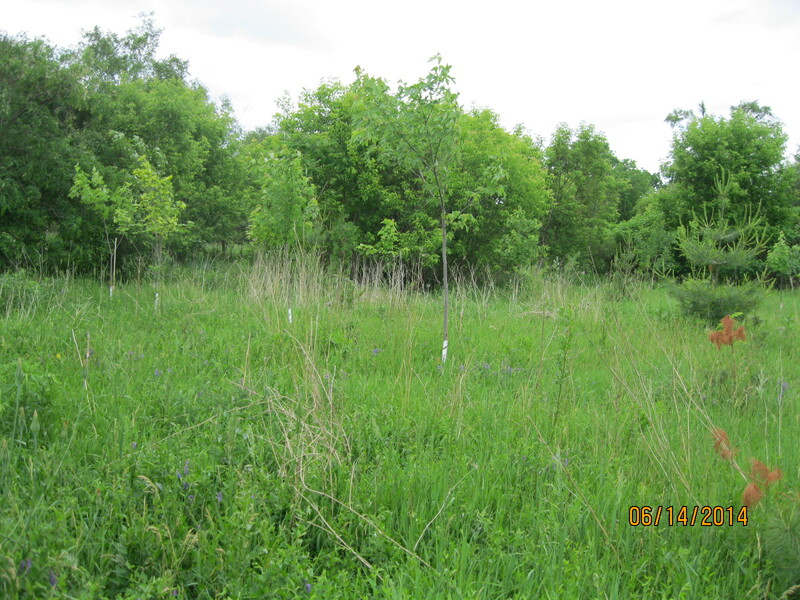 It grows in wetland areas but it’s dense mats of leaves tend to cause the marshes to dry up reducing native habitat. 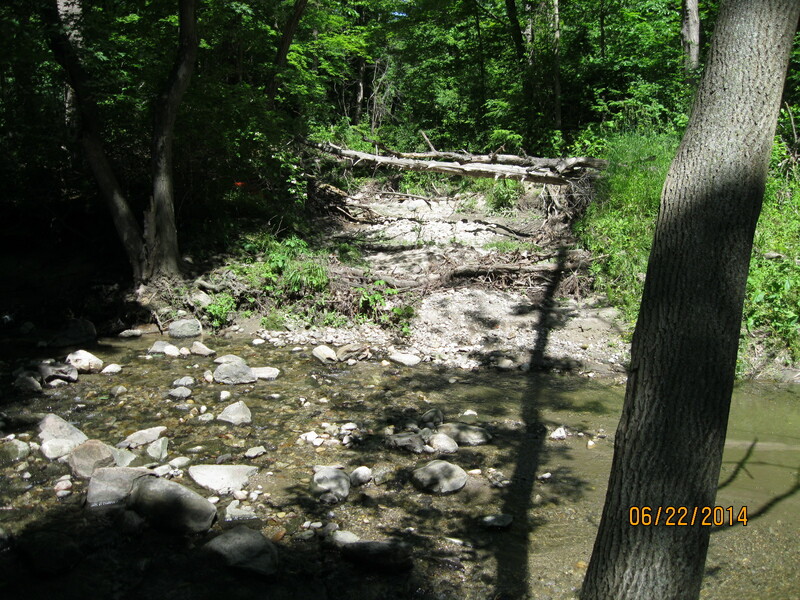 This entry was posted in Hiking GTA, Humber River and tagged GTA, Hiking, Humber River, Toronto on June 15, 2014 by hikingthegta. It was cloudy but rain wasn’t predicted until later in the day. I parked in the lower parking lot off of Lawrence just east of the Don Valley Parkway. Lawrence Avenue used to take a small jog into the valley where it crossed the East Don River in Milne Hollow where the hamlet of Milneford Mills was developing. 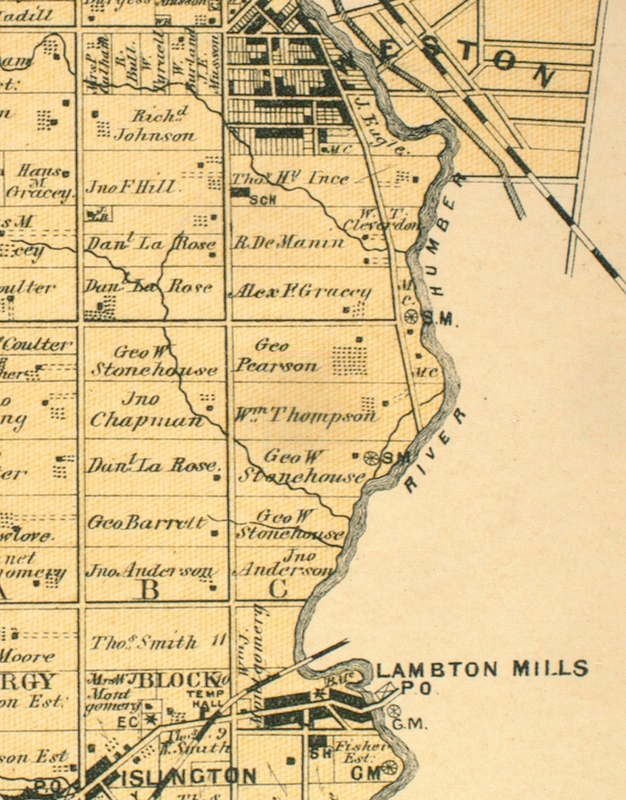 Scottish miller, Alexander Milne, started a mill on his property on the South west corner of Leslie and Lawrence in 1817. This site is currently home to Edwards Gardens. 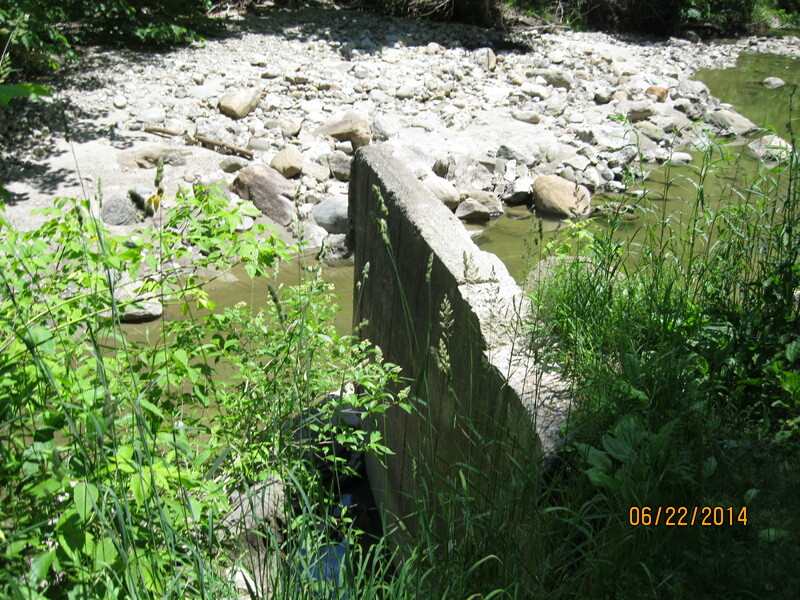 Wilket Creek flows through the property but had inconsistent water levels and so he moved his mill and homestead to another property of his. He owned 120 acres on the East Don river just south of Lawrence. He moved his farmstead here in 1832. The mill village that grew up near the mill was called Milneford Mills and included a dry goods store, a wagon shop and workers quarters. In 1846 he built a woolen mill which was destroyed along with the entire mill village by the severe flooding of Sept. 13, 1878. Milnes rebuilt and the woolen mill ran into the early 20th century. When the Don Valley Parkway was built in the mid 1950’s the remaining buildings were removed, all except the Milne family home. 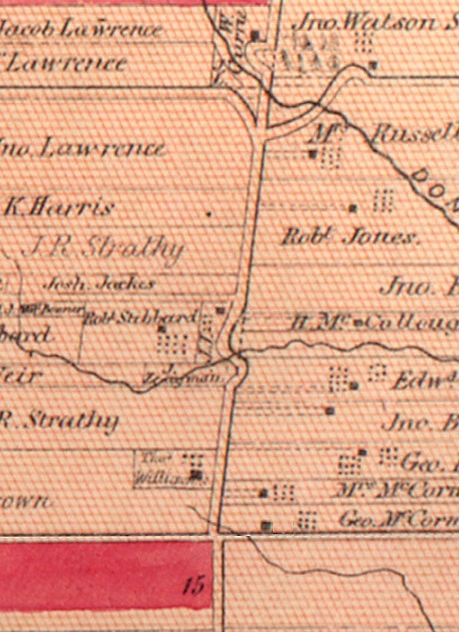 In the 1880 County Atlas several buildings are marked as well as the two mills. 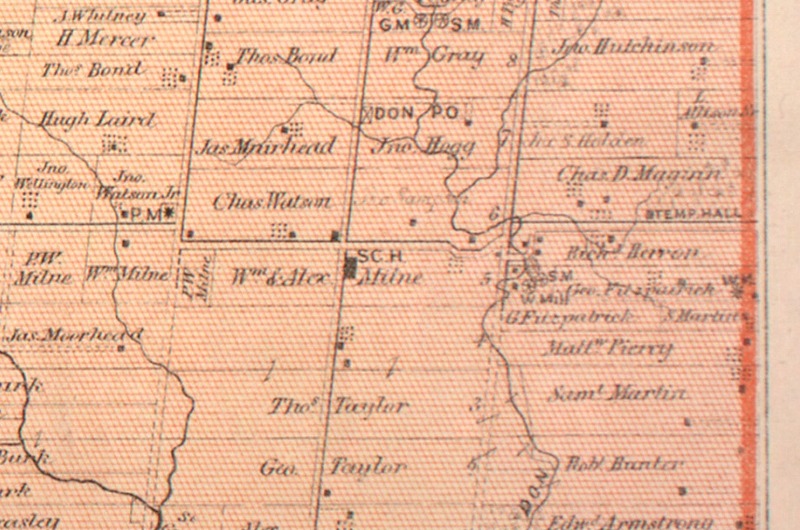 They are located on the river on the right hand side of the map, near the middle of the page. The house was built in 1871 and is one of the oldest examples of gothic frame architecture in the city. The front porch which used to look out over the mills has been removed. 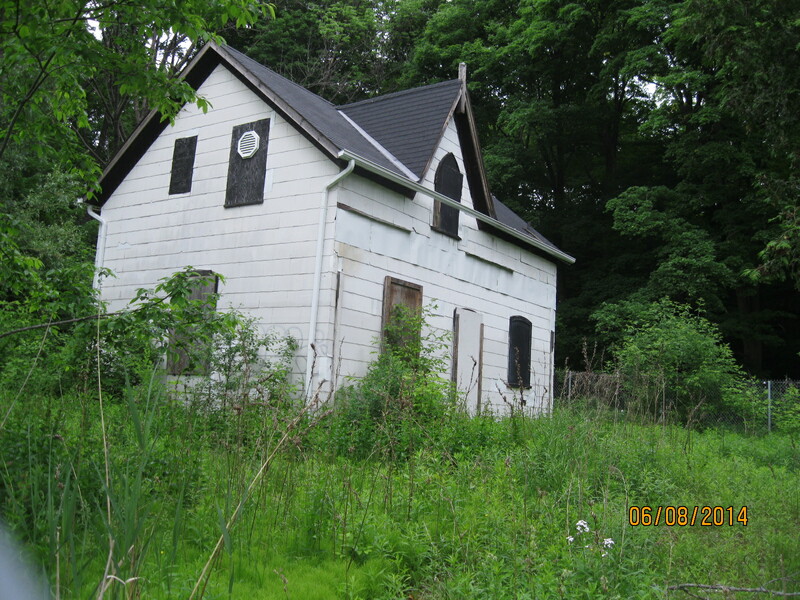 Now abandoned, it is intended to be restored eventually. The eastern embankment south of the house was turned into a ski hill in the 1930’s and was run by the Don Valley Ski Club. With three lifts, two rope and one Poma it also boasted a $70,000 snow making machine. There were several 200 m runs dropping the 40 m of slope to the bottom of the hill. It lasted until around 1976. Today a lone ski lift tower stands halfway up the hill. It is slowly disappearing in the new growth of trees that have been planted to rehabilitate the hill side. 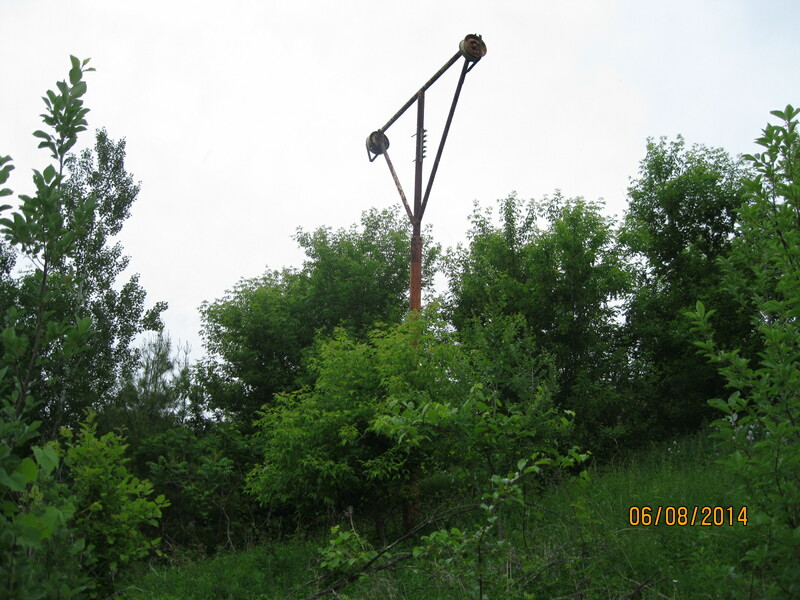 At the base of the hill, behind a large willow tree stands a series of wooden posts that once supported the loading platform for the ski lift. Behind here two steel rails sit on the ground. As you walk along the edge of the river the trail is lush with sumac and aspen trees. There are several wetlands along the way which are full of water fowl. The trees are alive with the sounds of various songbirds. A short walk past the old ski hill brings you to the ruins of an old dam. 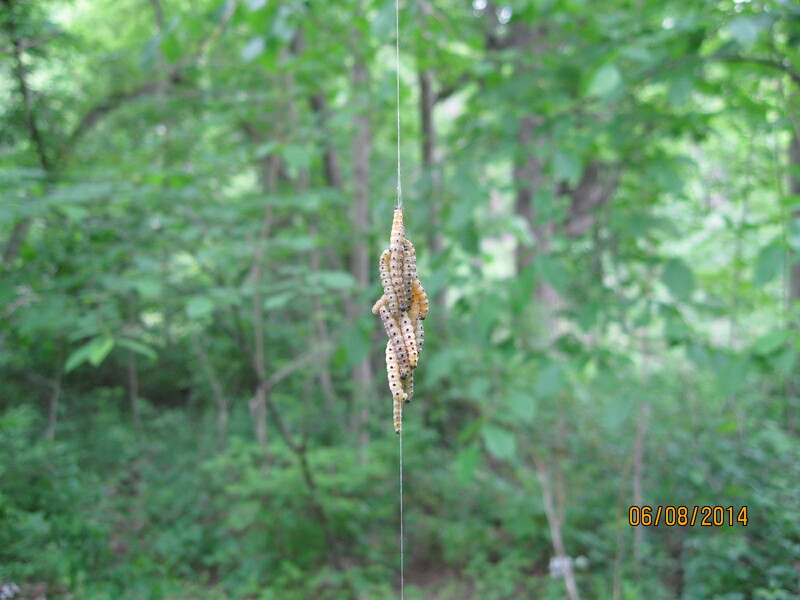 A little farther along I saw this group of silk worms. You will come to a bridge that gives you a choice to cross the river. 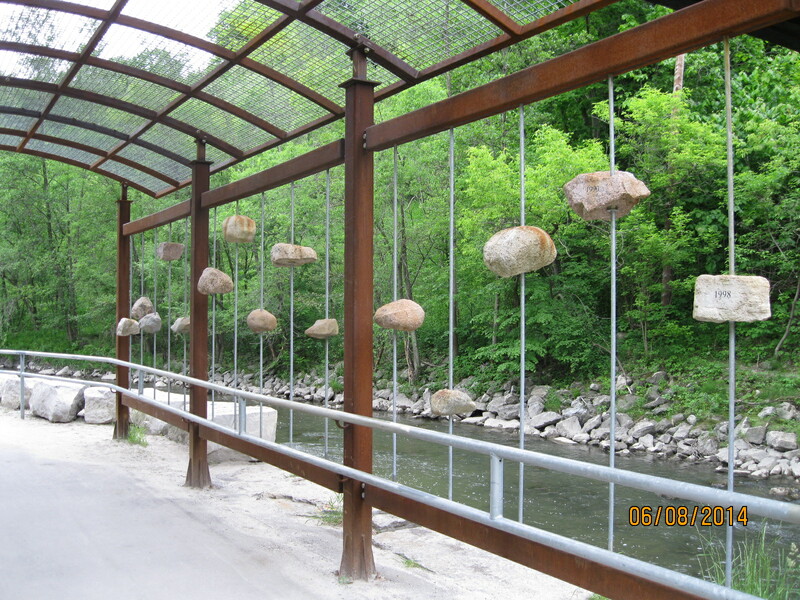 Crossing the river leads to the display below and to Tim Horton’s a little farther along. This display, known as High Water, marks the various flood waters. The highest rock is from 1934 and must be at least 12 feet above the current water level. Hurricane Hazel, which hit the west end of the city hardest, didn’t flood the Don severe enough to get a rock in the display. If you stay with the east side of the river you will have to climb up over the CN tracks. On the far side the steep dirt hill leads to a trail that passes through a thick growth of trees. After following the river for a while you will come to Anewen Park. The Ontario & Quebec Railway was incorporated in 1871 and built a line north of the city of Toronto. The high trestle bridge over the East Don River was constructed on round piers of cut stone. When the CPR, who ran the line, double tracked it around 1898 new sets of piers were built of concrete. In the photo below you can see the two original round bridge footings which were capped with concrete when the rail line was double tracked. The CPR bridge in the distance as it crosses the East Don river south of Lawrence Ave. 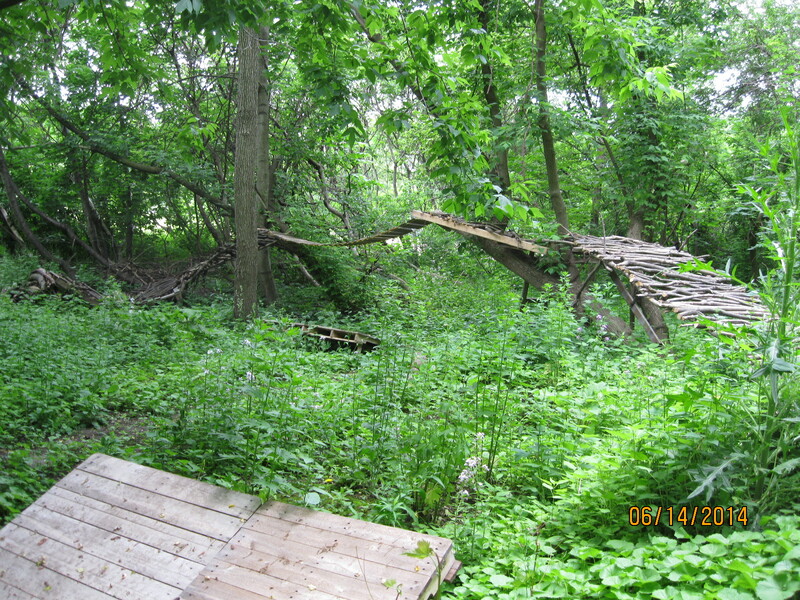 This entry was posted in Don River and tagged Don River, GTA, Hiking, Toronto on June 10, 2014 by hikingthegta.